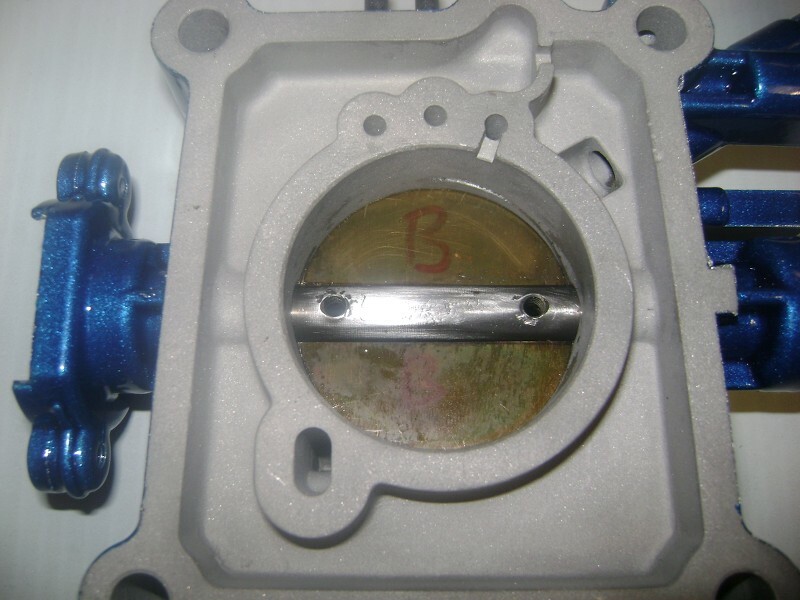 This is a step by step tutorial on how to tear down and rebuild the throttle body including the replacement of the throttle shaft seals. For those of you who have looked through my restoration thread, many of these pictures are the same, however in this thread I will go into more detail of what and how-to, whereas in my restoration thread I glossed over some things. Hopefully this helps a few people out in the years to come. Tools required for tear-down are pretty straight forward. You'll need a phillips head screwdriver, an 8mm nut driver or scoket and maybe a pair of needle nose pliers. 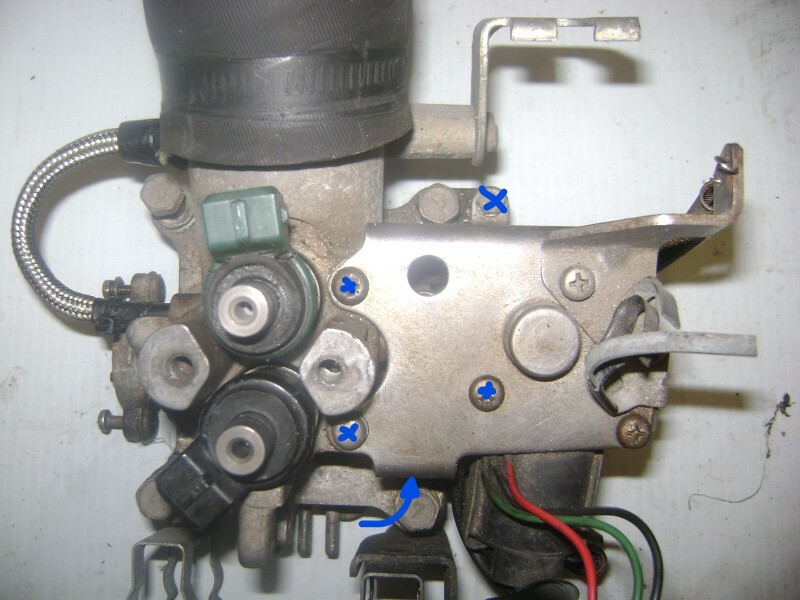 Depending on how often things have been apart on your car this very first step could be your most difficult and make you want to abandon doing this altogether. 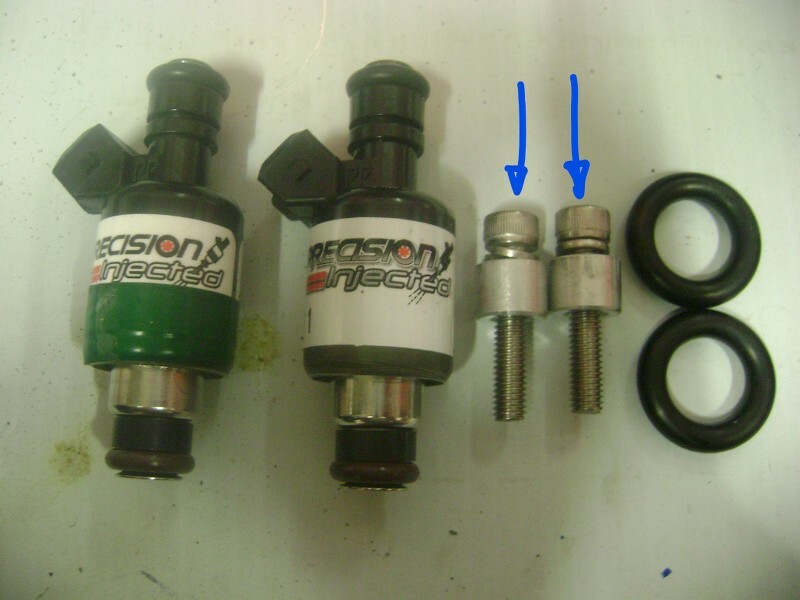 You need to remove to the top two screws pictured below. They can be really frozen in there and I've read horror stories of them shearing off trying to get them off. Hopefully that doesn't happen to you and they come right out. There's very little room to get vise grips or anything of the like in there so you might want to soak them in PB Blaster and wait 24 hours. I WOULD NOT recommend putting these two back in, we'll talk about that more later. 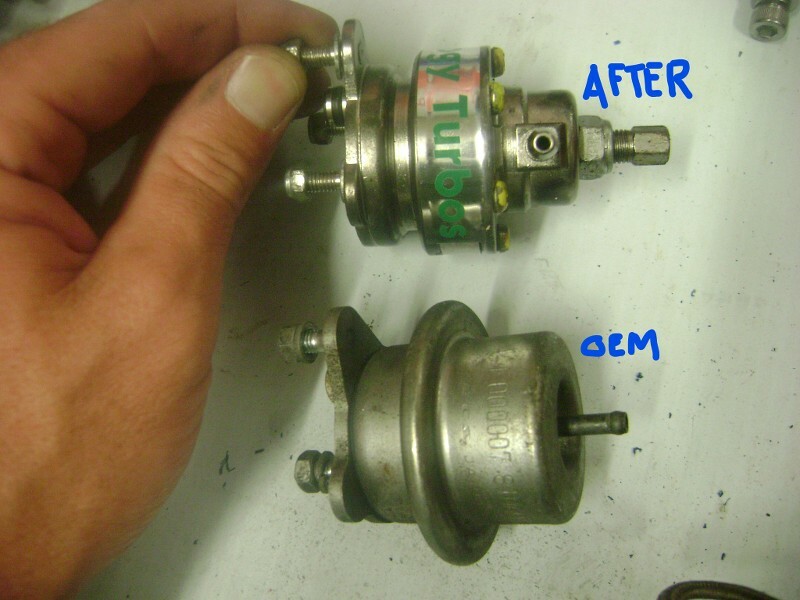 First, let's disassemble the pulsation dampener. Remove the two screws holding the cover on. 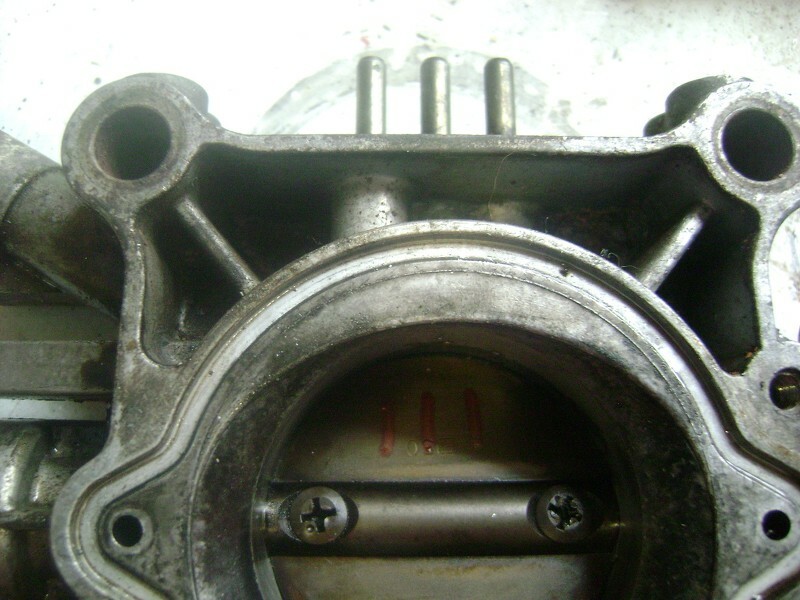 Once you open this up there will be an o-ring, a spring, and a diaphragm-type gasket that will be replaced later on in the rebuild. 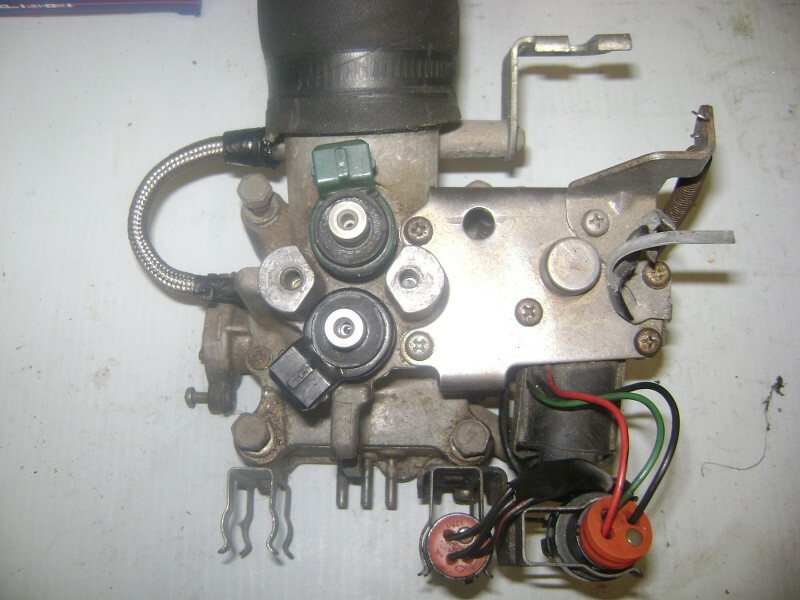 OPTIONAL: Depending on what you plan to do with your rebuild you may be interested in adding a fuel pressure gauge. There's a great little spot to do this on the back of the housing. 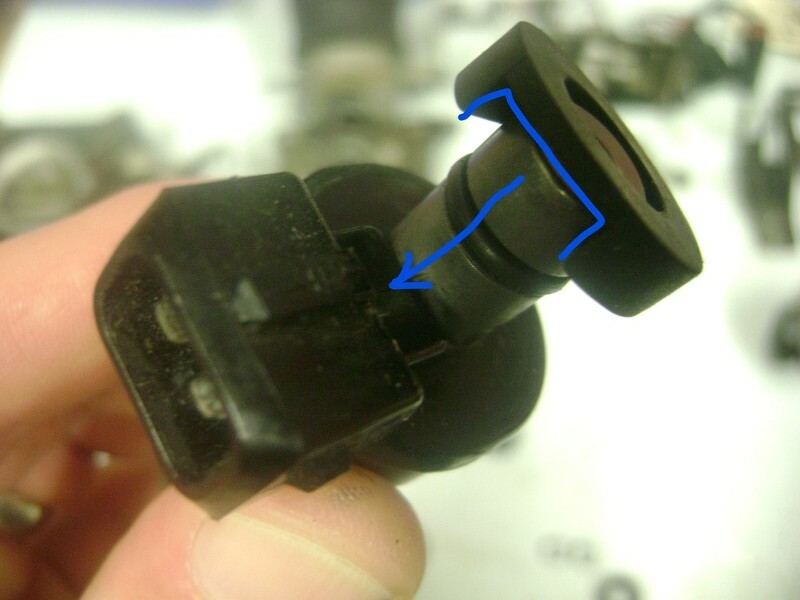 All you need to do is remove this allen key plug. It might be tough to get out, a little heat may help here. 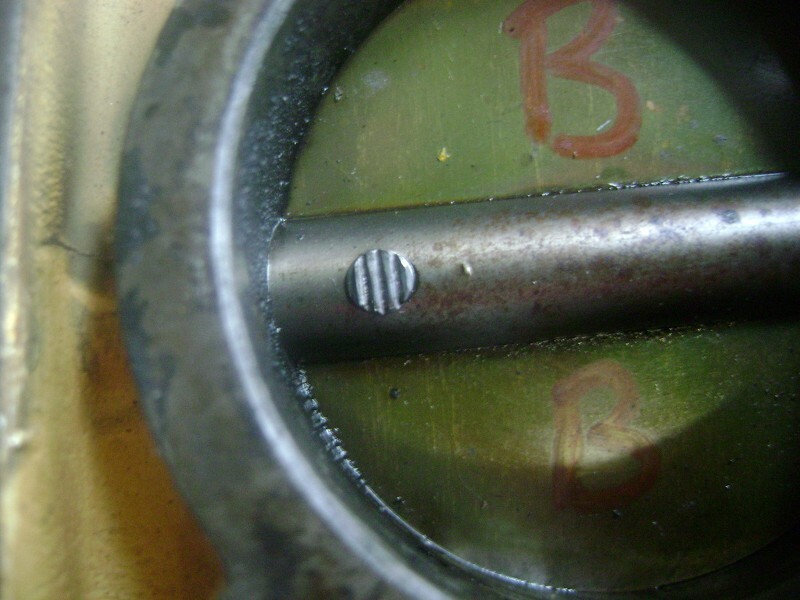 Thread is a 1/4" BSPT (taper thread). 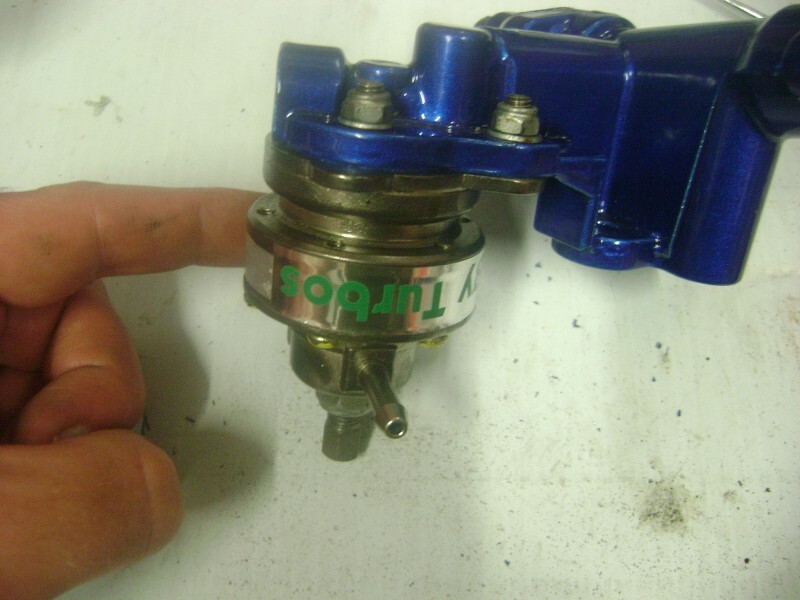 Most fuel pressure gauges are 1/8" NPT. 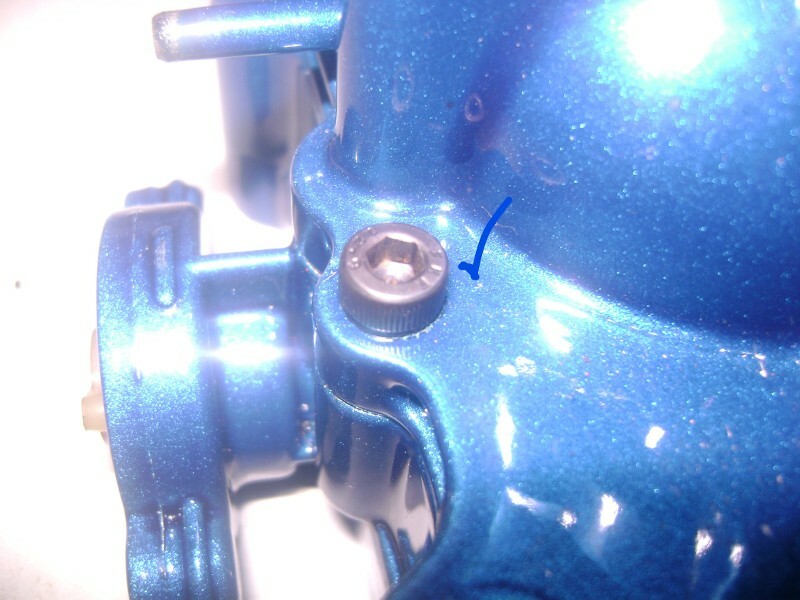 You can tap this out to just a 1/4" NPT at this time, and put a 1/4" to 1/8" reducer, or find a 1/4" BSPT to 1/8" NPT adapter (they do make these), or you can purchase other Earls-type fittings to change the position, angle, whatever you want. 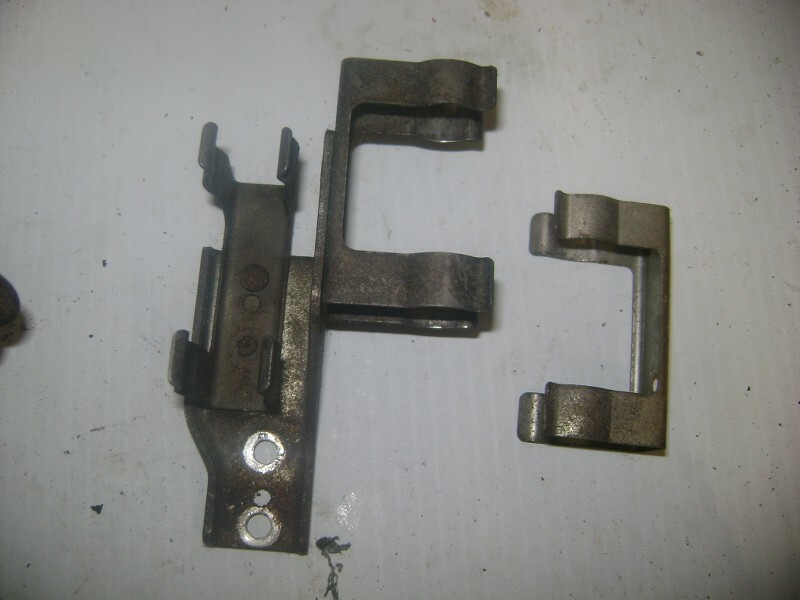 The brackets will come right off with the screws removed. Set them off to the side. With the brackets out of the way we now have access to all the ISC screws. There are 5 total that you need to remove in order for it to come off. Once they are removed the ISC will "fold" over out of the way. It will still be attached by the long thin spring. Get your needle nose pliers and gently twist it out to fully remove the ISC. 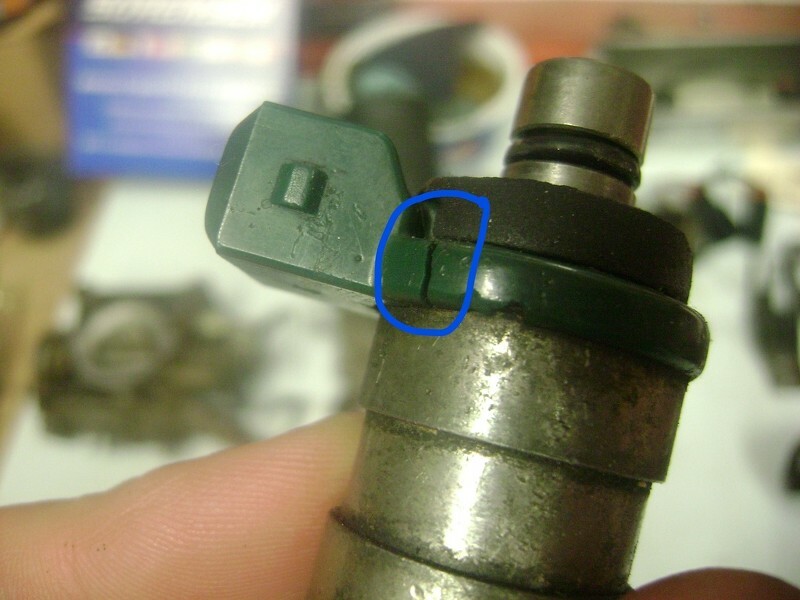 If you haven't already, pop out the primary and secondary injectors. Make sure the bottom o-rings come with. You can set those off to the side too, more about them later. 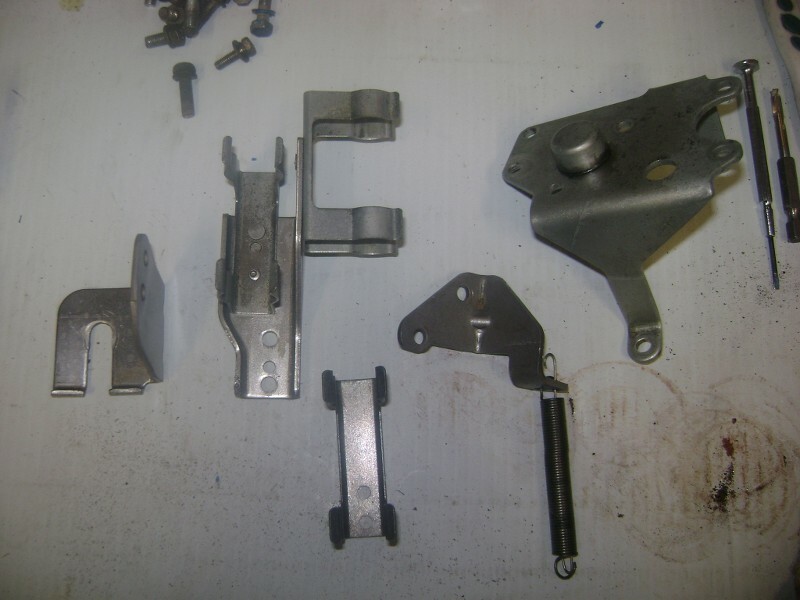 The last step to getting your TB tore down into it's basic pieces is to separate the TB halves. There are two screws left that hold it together. ... and you'll be left with this underneath. For the basic disassembly of the TB, that's it. 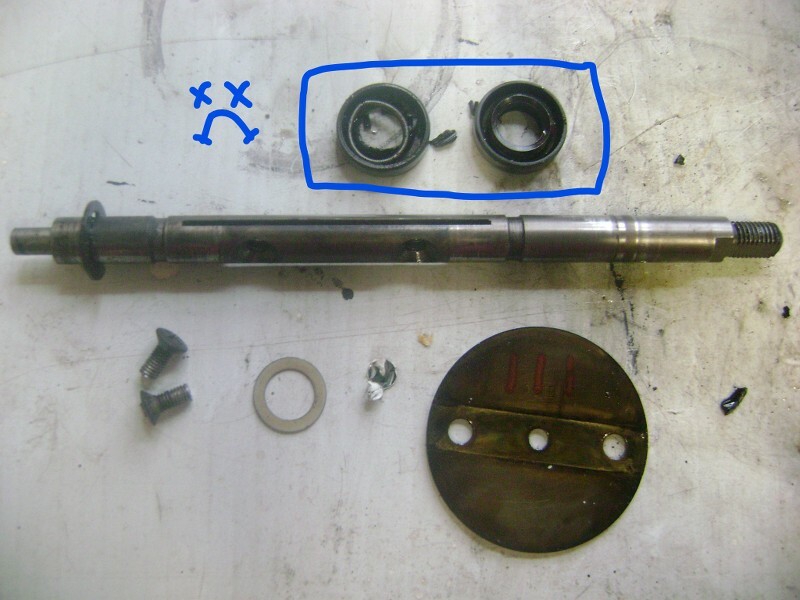 We're going to take things a bit further by disassembling the throttle plate as well and replace those pesky shaft seals. Edited by techboy, 03 September 2017 - 10:59 PM. 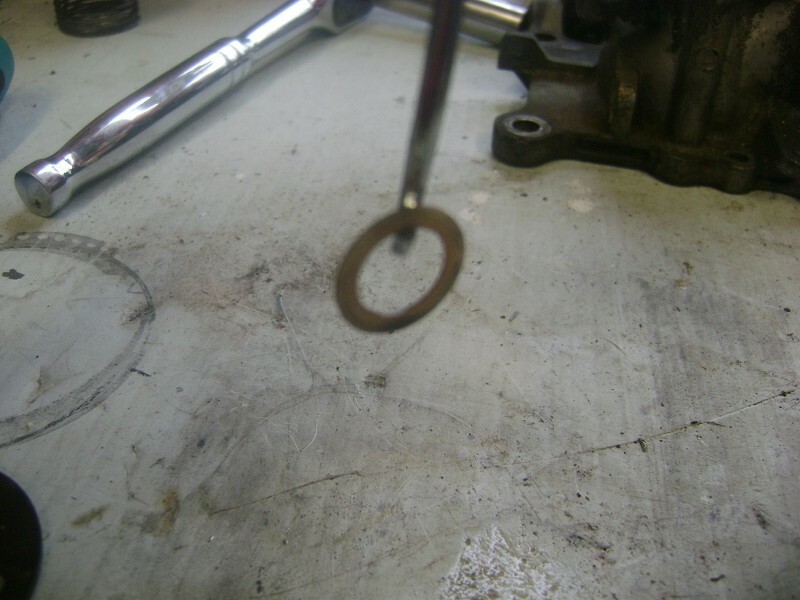 The next thing we want to do is carefully remove the throttle spring. 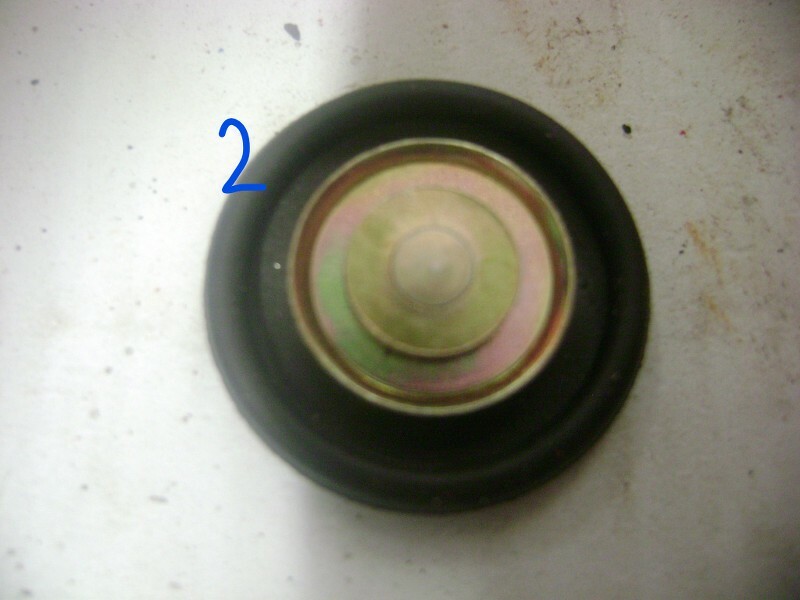 I would suggest taking some Testors paint and painting a line on the throttle spring so you can just match it up when you re-wind it. Beats having to count and all that. 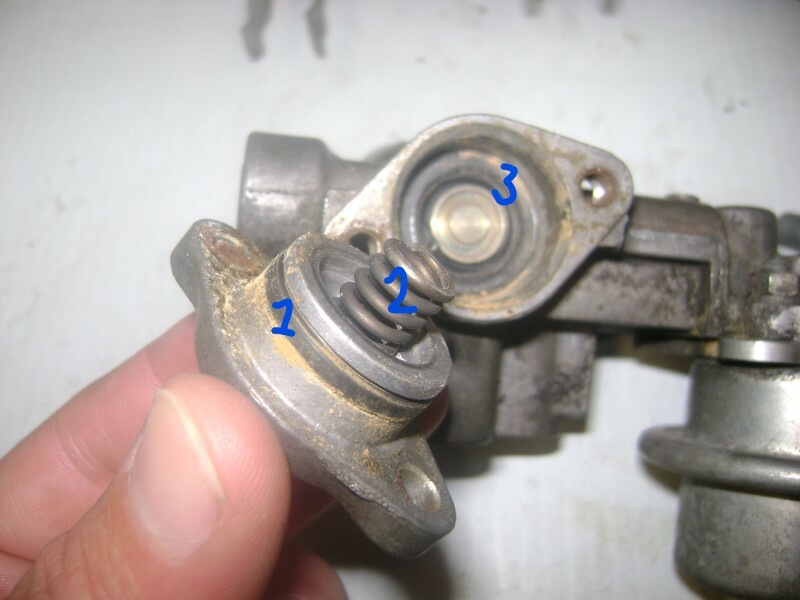 Remove the 12mm nut on the end and remove the linkages and the spring. You should be left with this. 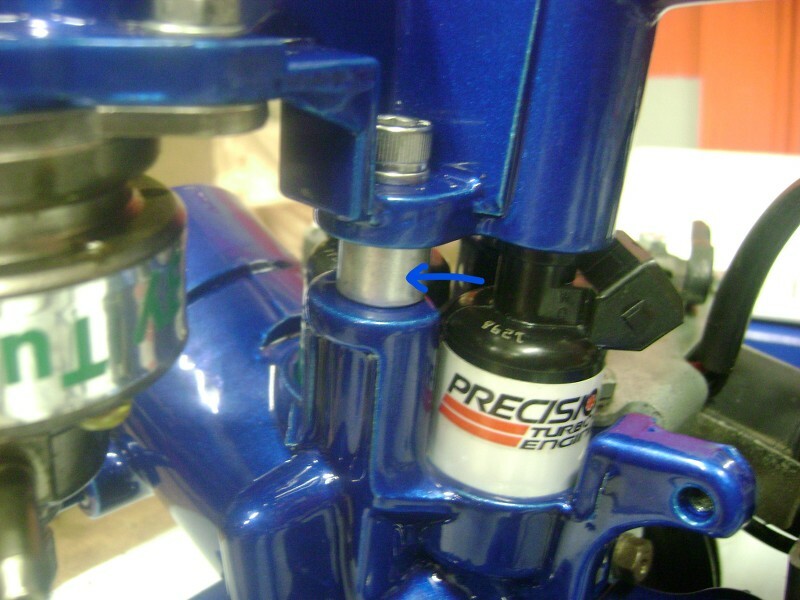 Before you take the throttle plate out, you want to label everything so it so goes back in the the proper orientation. 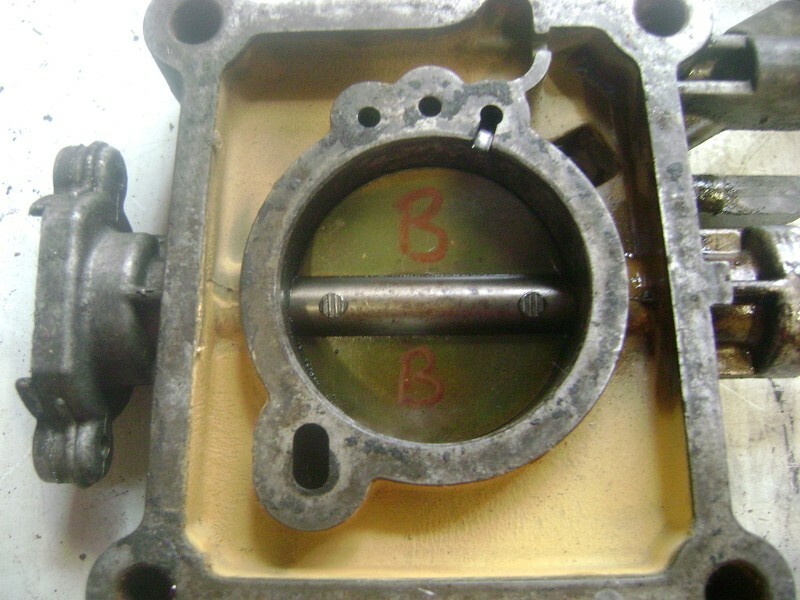 I puts "B's" on the bottom for "bottom" and I used 3 lines to represent the side with the three vacuum lines on the TB. 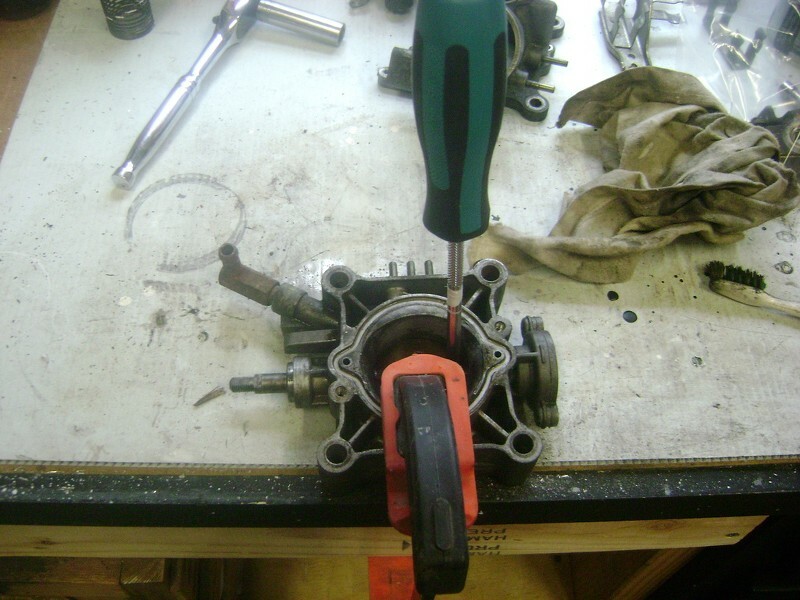 Now it's time to remove the butterfly screws so we can get the throttle plate out. 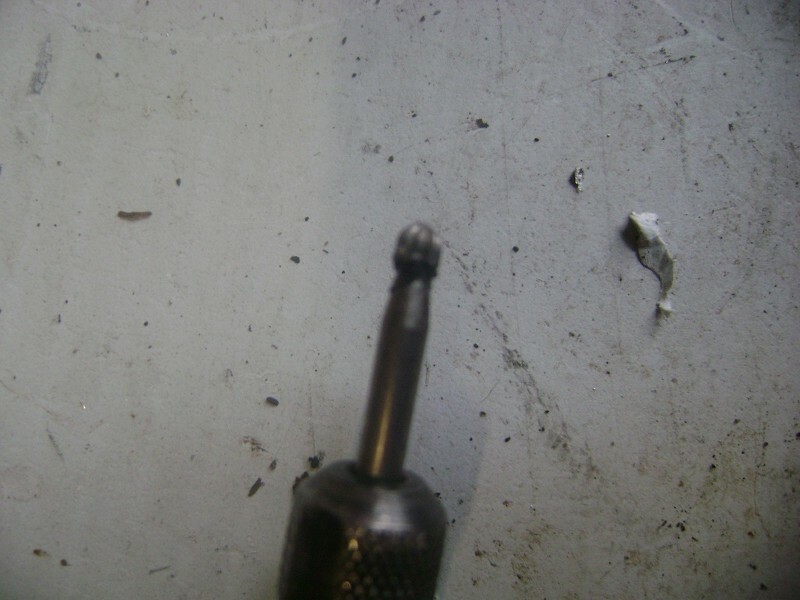 I started by grinding off the staking on the backs of the screws. I used a small grinding bit in my dremel. Sorry the camera had a hard time focusing on this small item. Here's what it looked like for me. 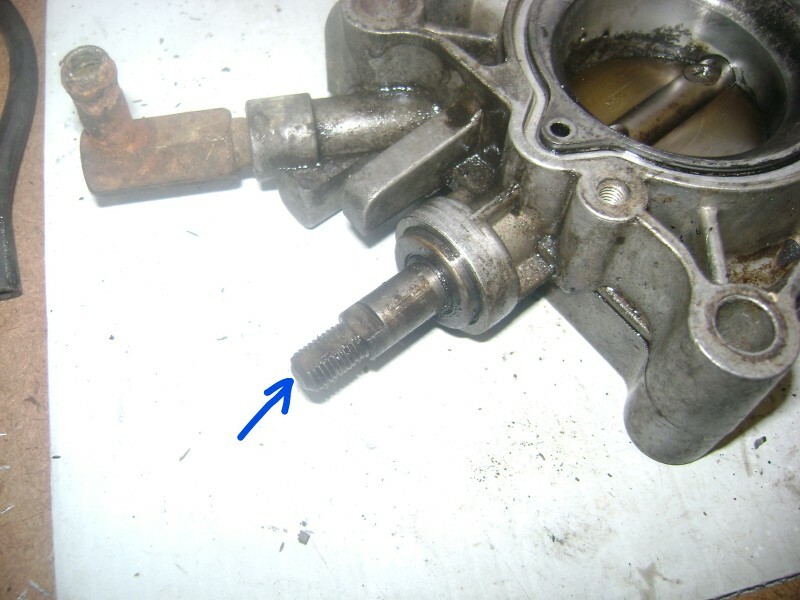 If you do this, be very careful to not nick up your throttle shaft too much. You can see I hit it in a few spots. More on that in a minute. 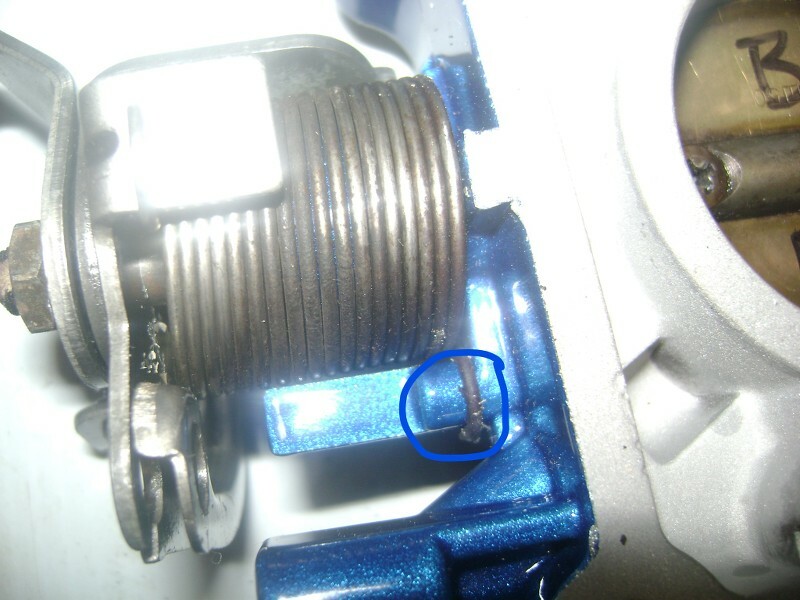 You can see in this pic below that when I tried to remove the butterfly screw on the right w/ a regular screwdriver it started to cam-out immediately. So I stopped. 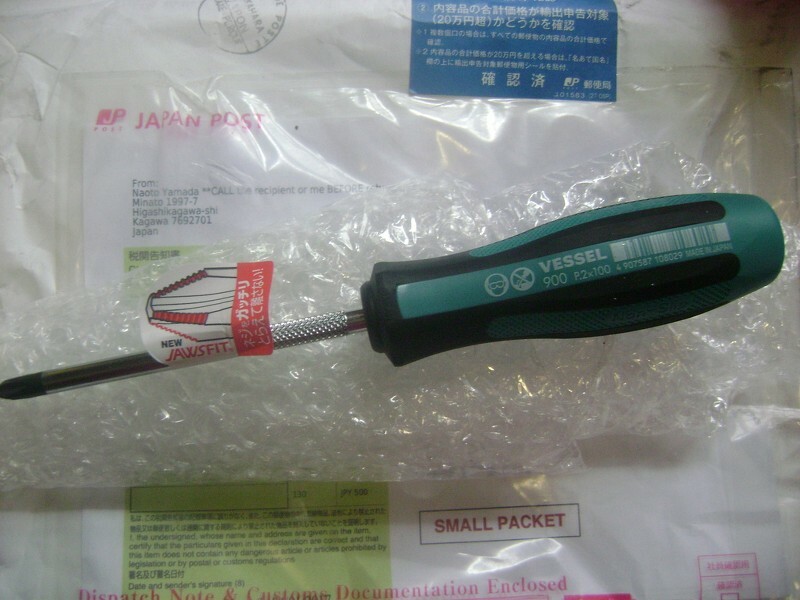 They took a few weeks to show up b/c they literally came from Japan, but I ordered this set of JIS screwdrivers from Vessel. I highly recommend these as you'll find them useful for many other locations on the car. Once they arrived, I clamped the assembly down to my workbench with a wood clamp and grabbed my new screwdriver. Make sure you keep some downward pressure on the top of the driver. After a slight "pop", both of them spun right out. 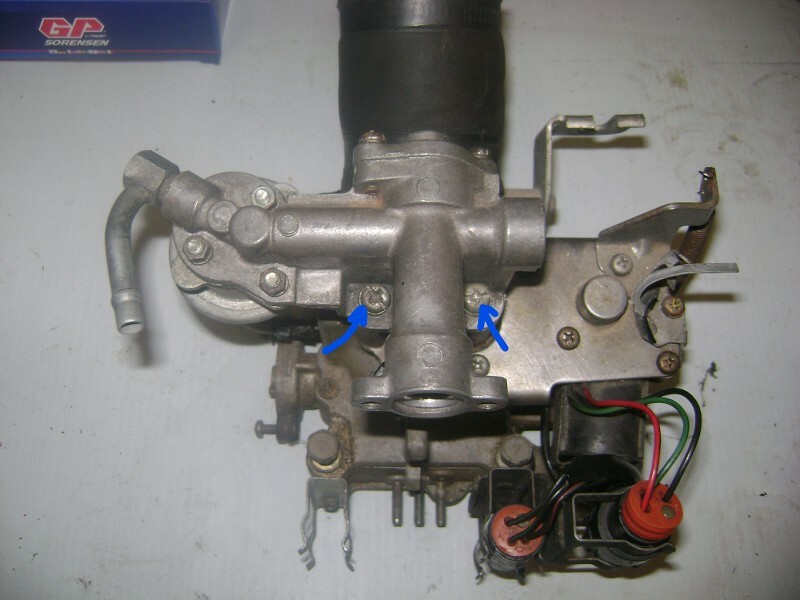 Once those two screws are out you should be able to slip the throttle plate out. 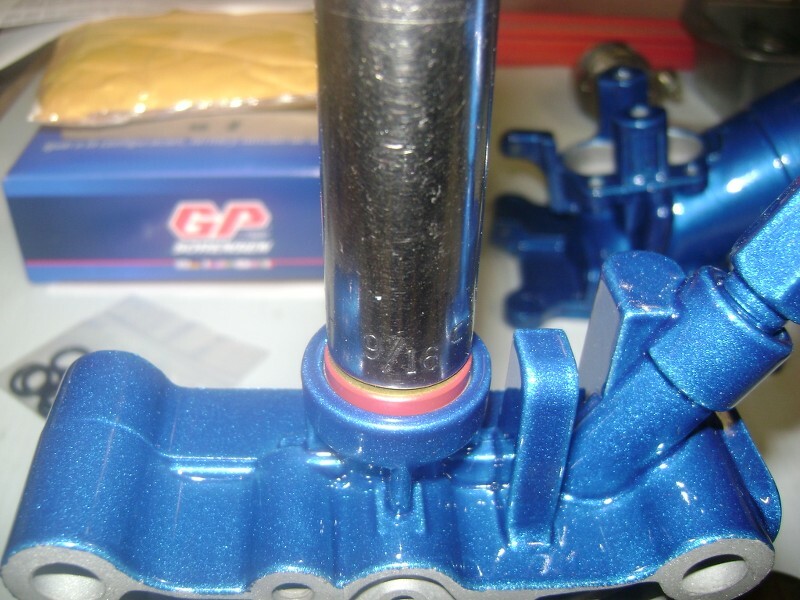 Before you go ahead and slide the throttle shaft out, get out some emery cloth and lightly sand down the burs and scoring on the shaft so you don't do any damage while sliding it out. You don't want to score anything. Mine didn't move to well, it took a couple of light taps with a rubber mallet and it came right out. 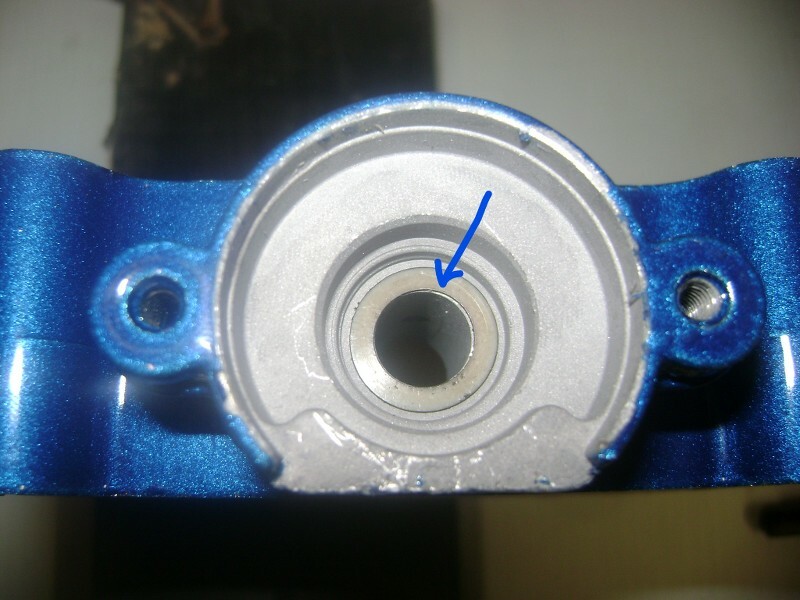 Once the shaft is out you want to immediately look for the teflon washer. Put that in a safe place till the rebuild. 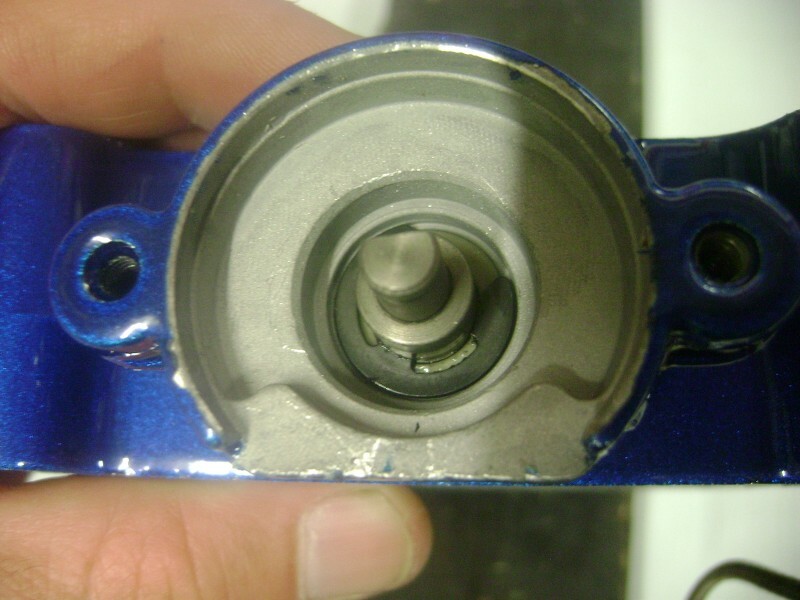 You'll now be able to remove the throttle shaft seals on each side. There's no need to try to save these on the way out, we're replacing them. I used a flat head screwdriver and popped mine out. And here's the whole entire reason we're doing this job in the first place. 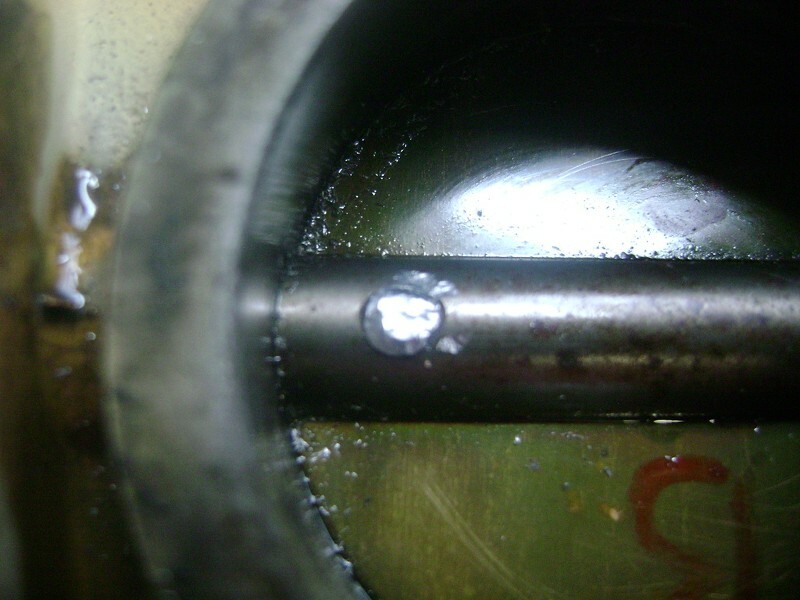 You can see that one of my shaft seals was totally shot. Edited by techboy, 04 September 2017 - 09:21 PM. After getting everything deconstructed I sent my TB out to be cleaned and powdercoated. You may choose to do the same or just clean yours up. You can soak it in a bucket of Simple Green or Purple Power. I can tell you from personal experience spray painting it will not last. 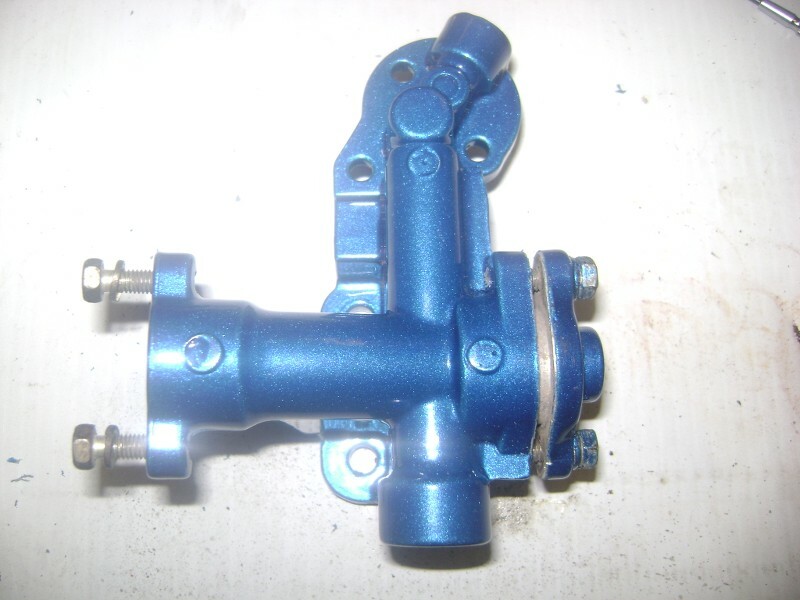 The first time you get a fuel leak at the feed or return line, or have leaky injectors all the paint will shrivel up and be ruined. It's up to you, but definitely clean it up a bit. 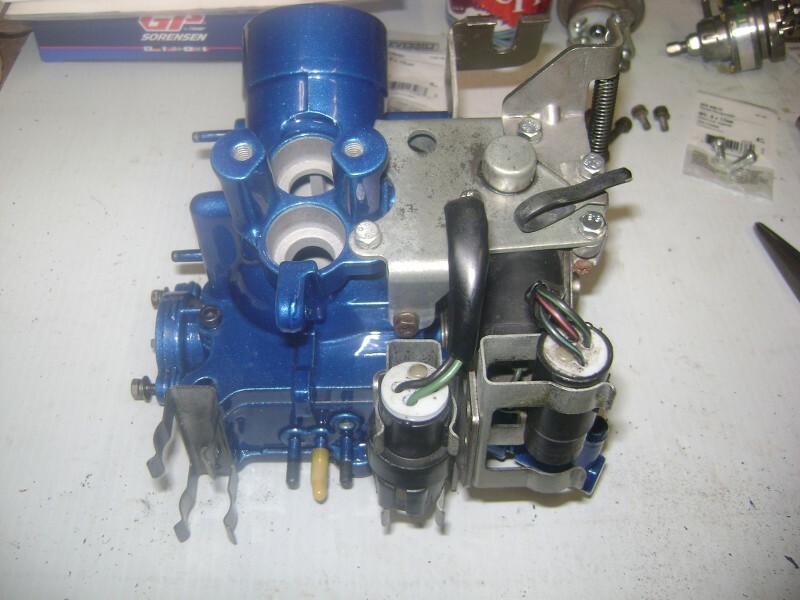 In addition to cleaning, you are going to need new shaft seals, a throttle rebuild kit (I recommend the GP available through DAD), a FelPro TB gasket, and anything else you may be replacing or upgrading. 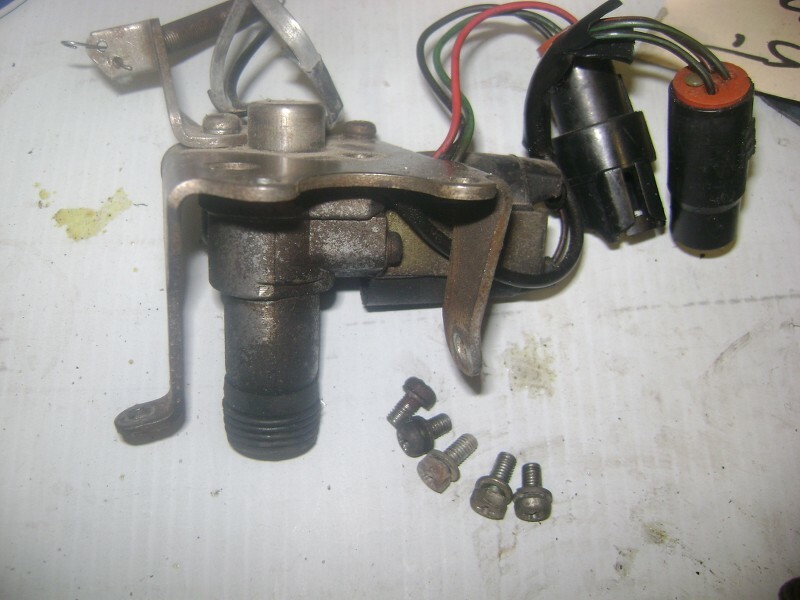 I chose to replace the fuel pressure regulator with an aftermarket Trilology model and replacement injectors. 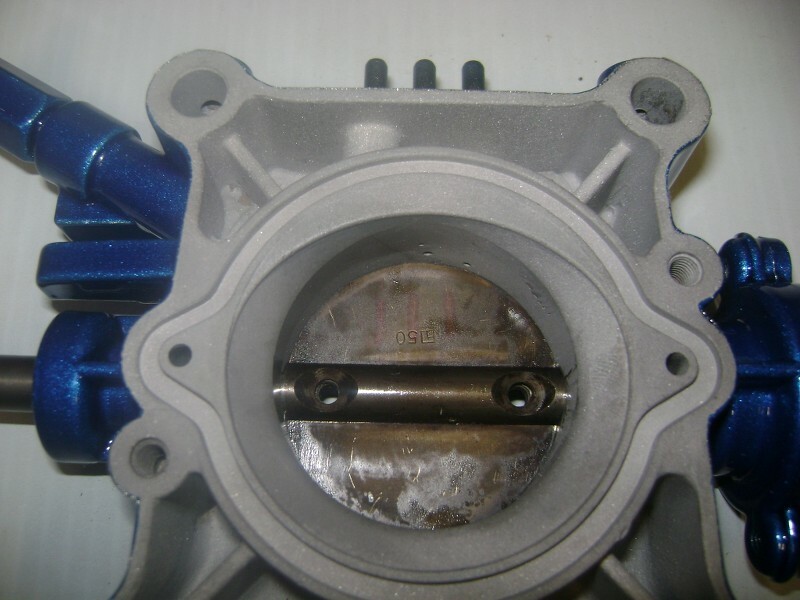 First thing we want to do is install the new shaft seals on the throttle body. 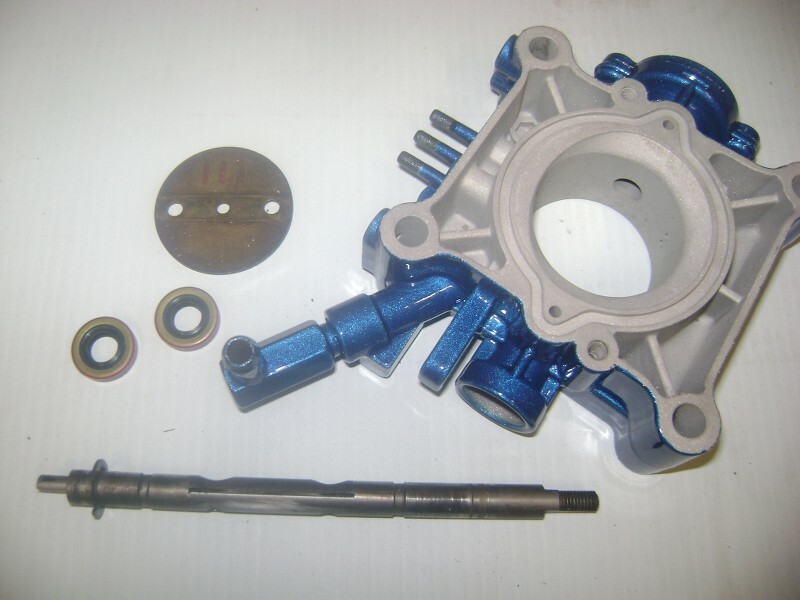 Get your throttle shaft and throttle plate. Everything I've ever read recommends the use of a 9/16th socket, so that's what I used to carefully tap the first one in. We're only putting one in at this time on the side opposite the TPS mount. Before I just slid the shaft back in through the new seal I wanted to be sure everything was nice and clean and free of debris. 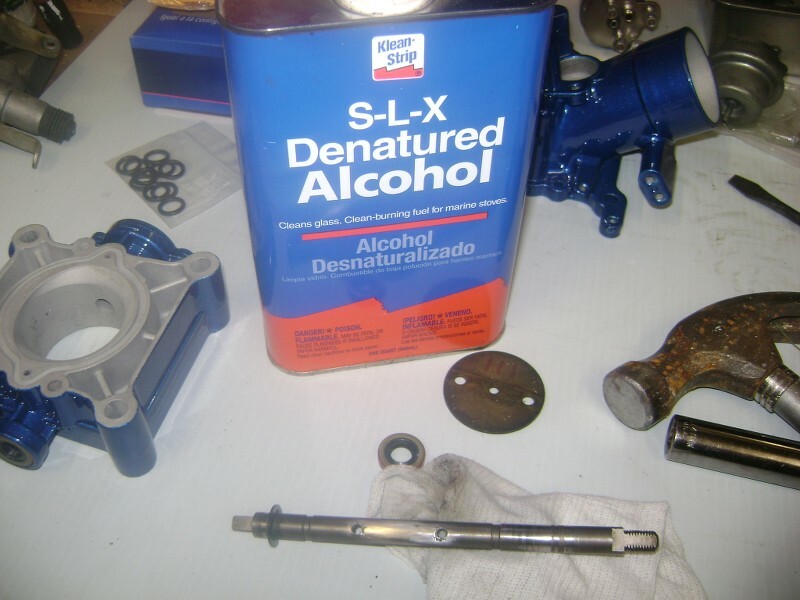 So I wiped it all down with denatured alcohol. 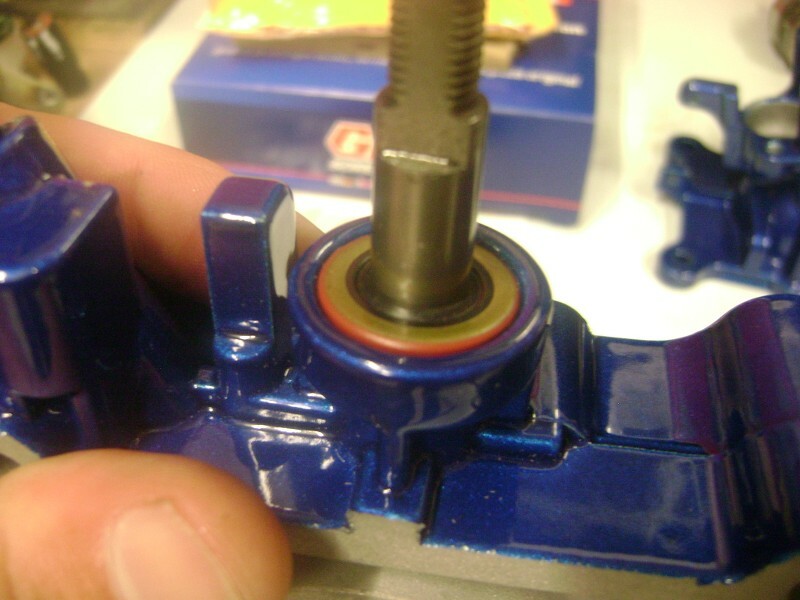 I also used assembly lube on the shaft to help from accidentally tearing the new seal. Maybe not necessary, but I was being cautious. 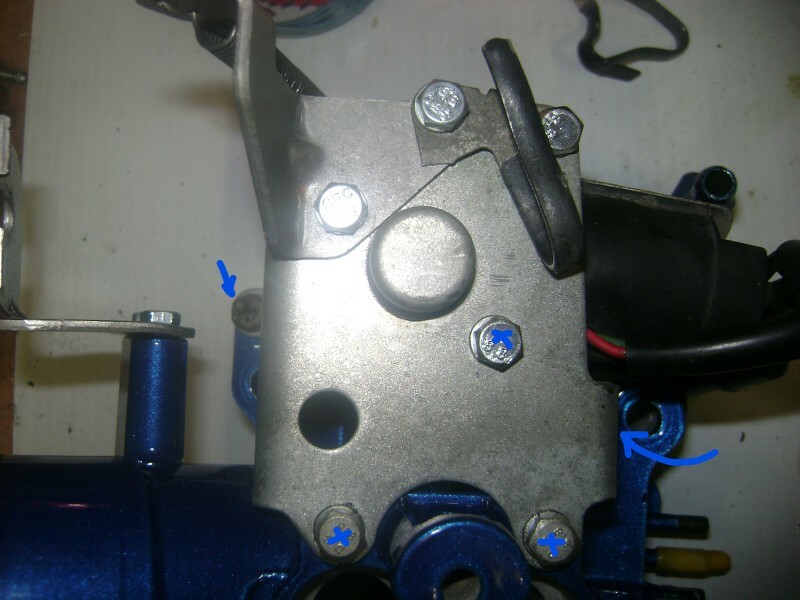 Next you want to placed the teflon washer back in it's place on the TPS side. 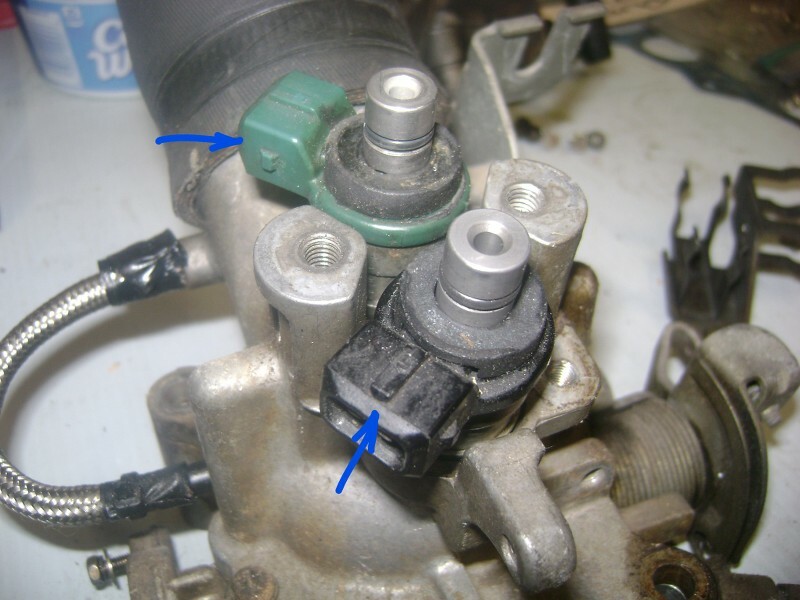 Do this BEFORE you slide the throttle shaft back in place. And then very carefully slide the shaft back into it's home. The teflon washer should sit under the cir-clip. 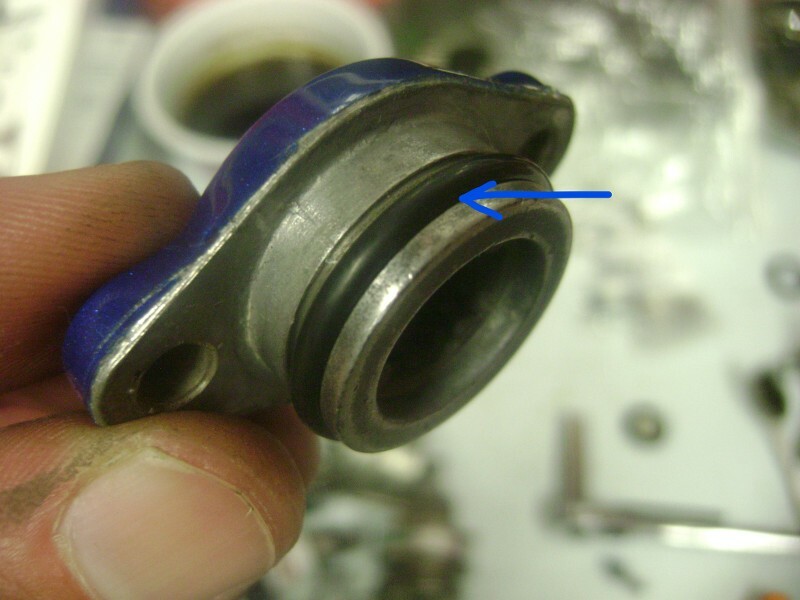 The whole purpose of this washer is to keep the clip from digging into the soft metal of the TB. 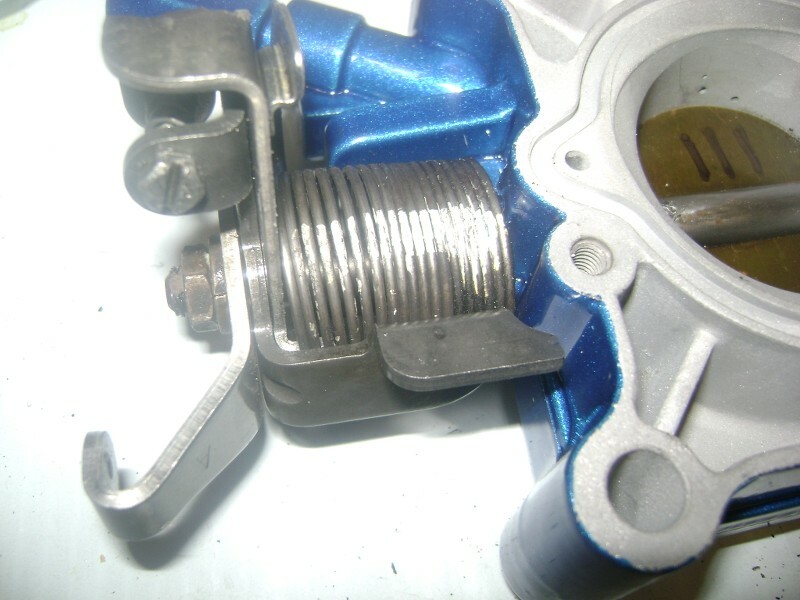 This is what it should look like on the throttle cable side where we already tapped in the shaft seal. 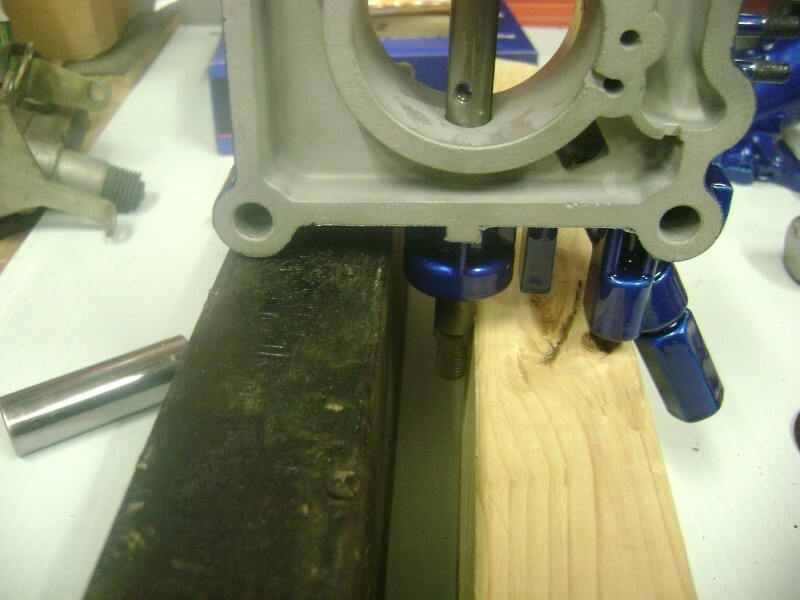 In order to tap the 2nd shaft seal in place you'll have to rig up some blocks of scrap wood or something. 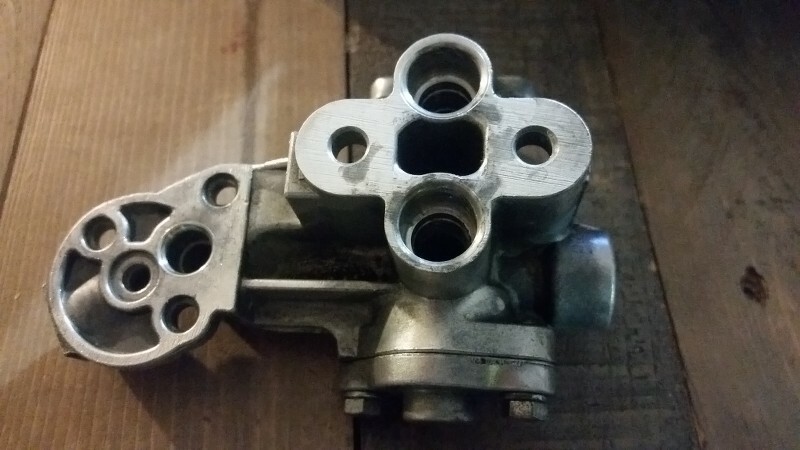 Otherwise when you stand it on end it'll be standing on the throttle shaft and you'll be tapping on that which you don't want to do. 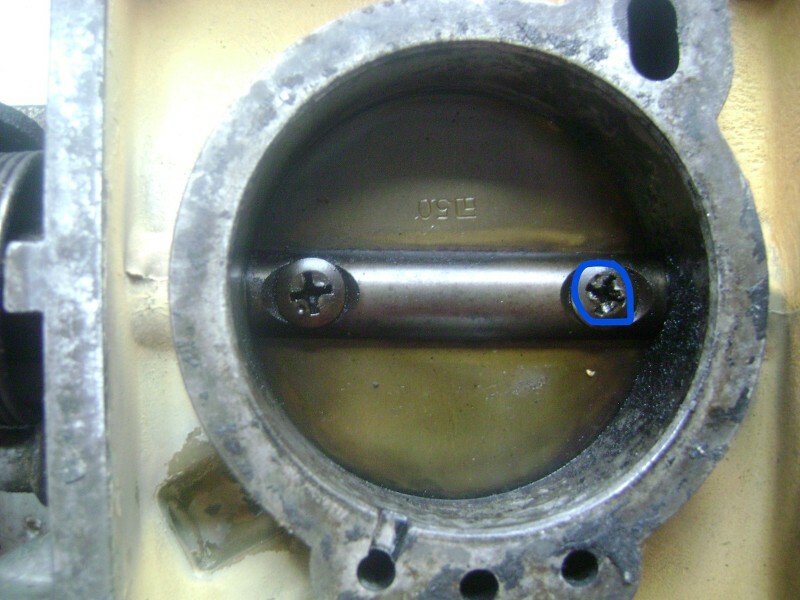 Grab your 9/16th socket and tap the 2nd shaft seal in place. With the shaft back in place with 2 new shaft seals it's time to put the throttle plate back in position. Pay attention to the markings you made previously. 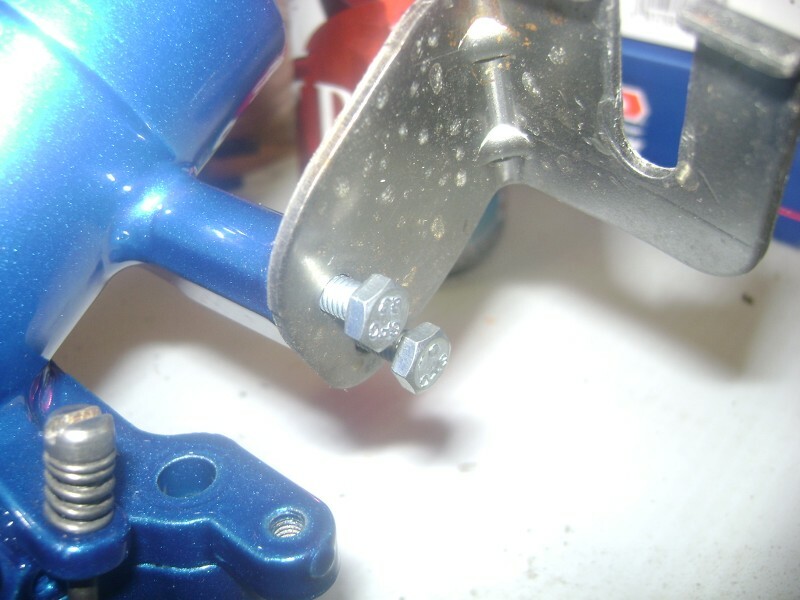 I used some Threadlocker Blue on the threads of the throttle plate screws to help hold them in place. I'm not sure if red or blue would be better, but this is what I had. I can tell you the 2nd day I took my JIS screwdriver and tried to gently back them out and they didn't budge. 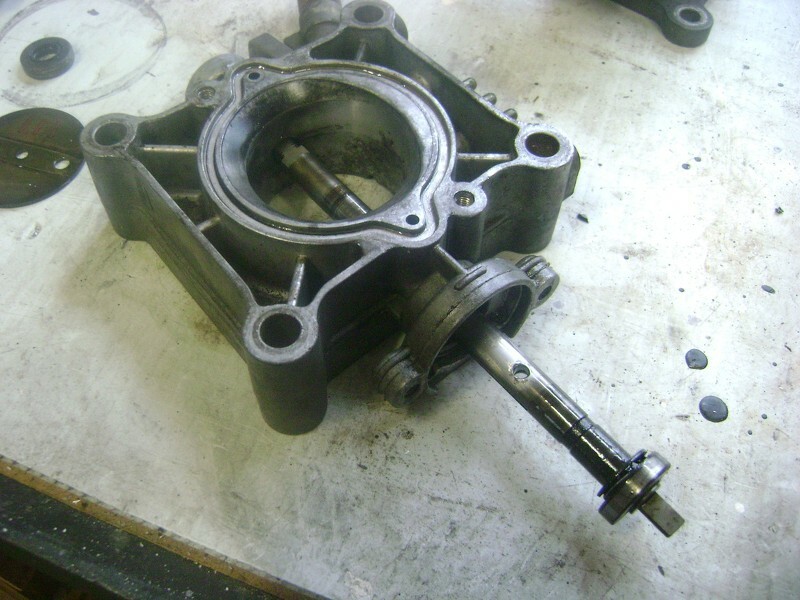 And that's the installation of the shaft seals .... all back together. 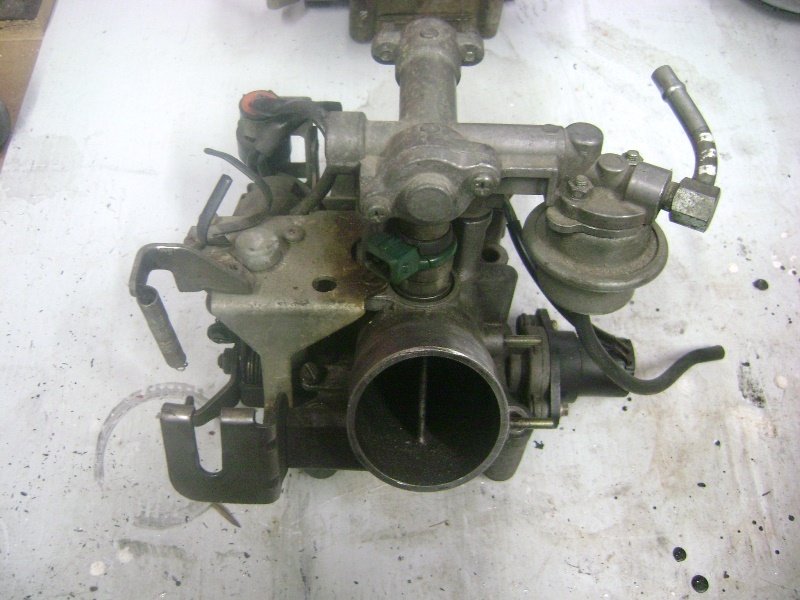 Next we'll reassemble the Throttle body. Edited by techboy, 08 September 2017 - 10:23 PM. 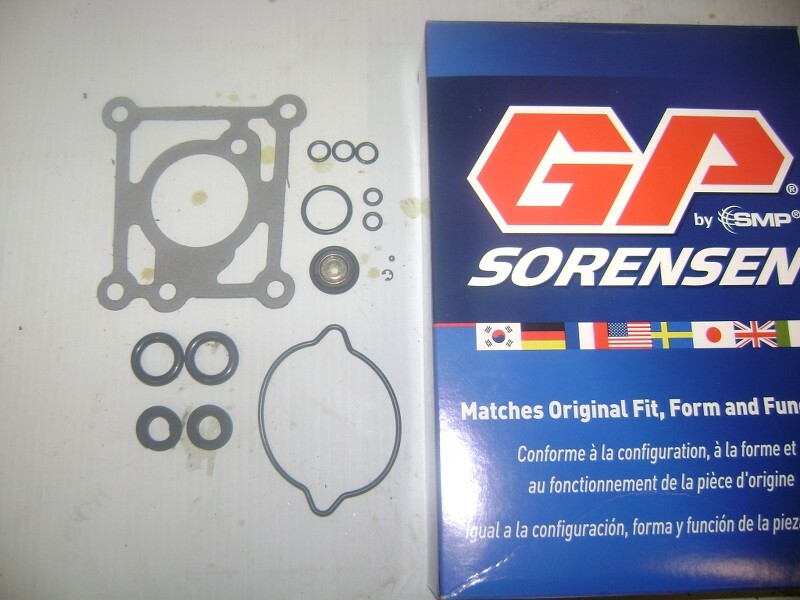 You also want to pick up the GP gasket set I mentioned previously. 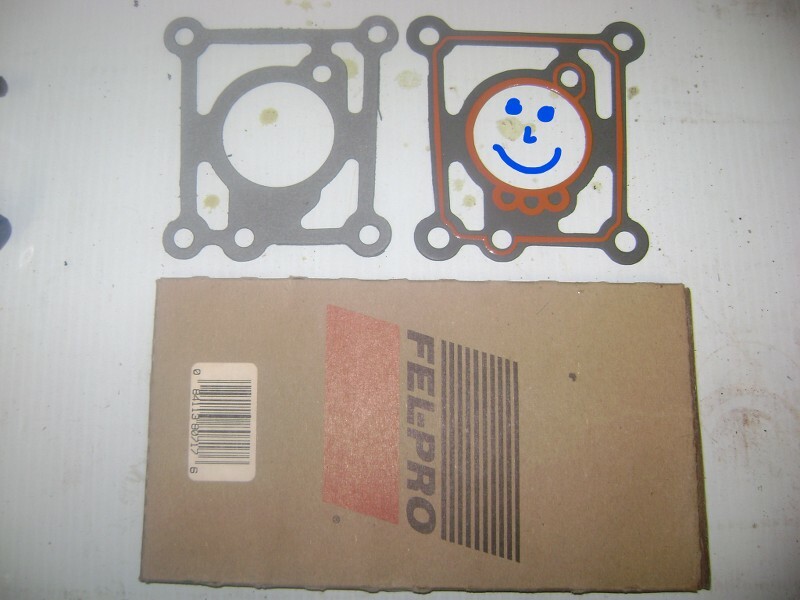 And, you definitely want to pick up the FelPro version of the TB gasket as well. 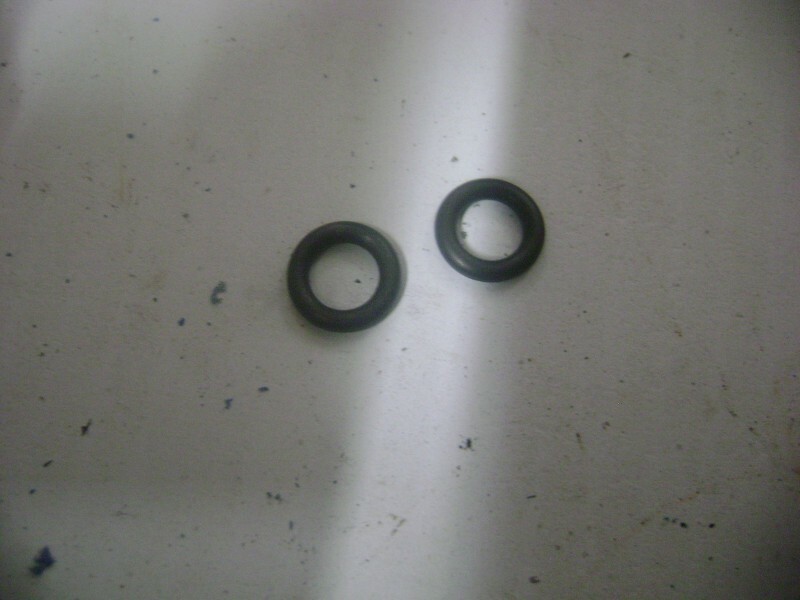 You can see the FelPro gasket on the right has a coating on that helps it to seal better. The one in the GP kit has leaked on me in the past and I've had to rip everything apart again. So, do it right the first time. 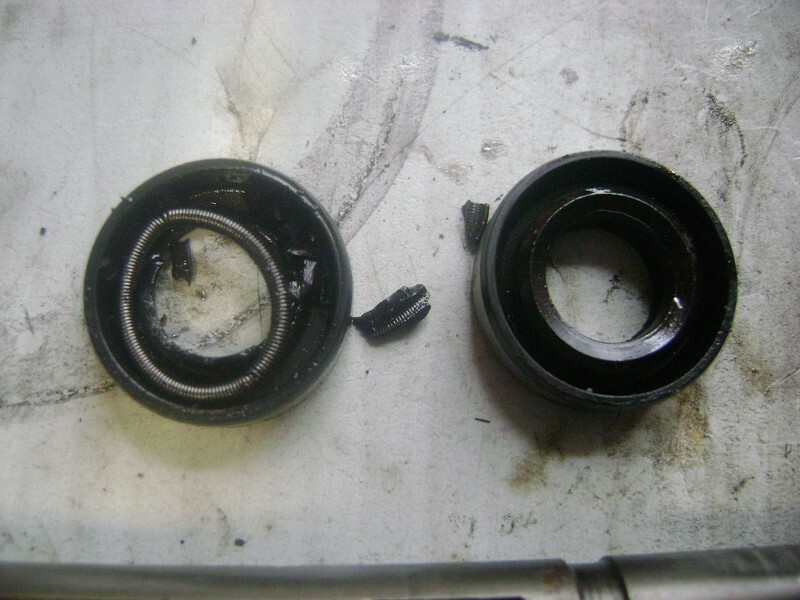 Before we can use the gasket rebuild kit though, it was time to rewind the throttle spring. 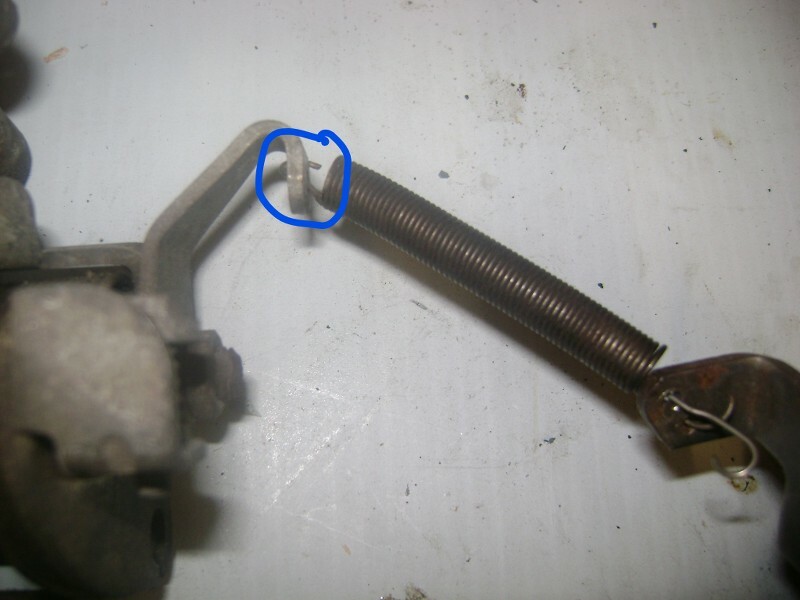 You want to slide the spring back on and make sure the little J-shaped hook grabs on the metal piece shown below. Then just simply wind until your painted-on line reappears. Here's that hook again from another angle. 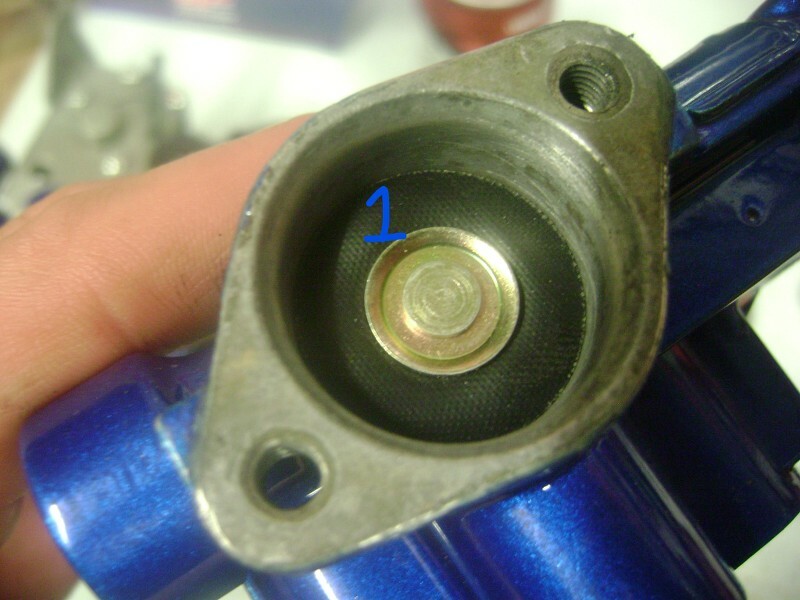 Once it's wound, put your 12mm back on and tighten down. 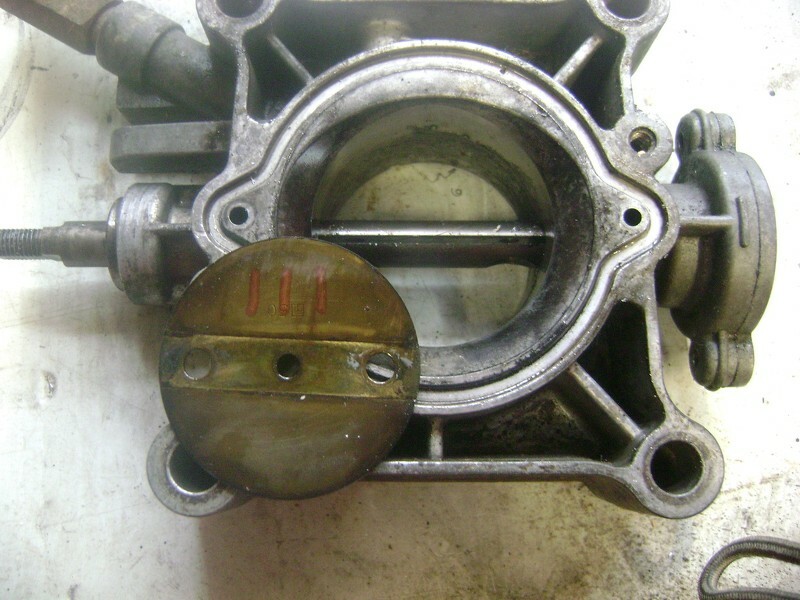 With the spring rewound it's time to bust into that gasket kit and put the gasket that goes between the upper and lower TB sections in place. Now it's to tighten down the two halves. I used fresh M5 -.8 x 16mm Allen heads. Highly recommend, can easily be removed with a T-handle allen wrench later if need be. Plus, they look waaay nicer. Here's where we're at with our two halves back together and the spring back on. Next I reattached all the various brackets. I cleaned them up as best I could on my wire wheel first and then clear-coated them to prevent them from rusting. Next I mounted the ISC back onto the housing using 5 new 8mm hex head machine screws. And here is the lower half rebuilt from two slightly different angles. The very last piece of all this to put our fuel top hat back together. 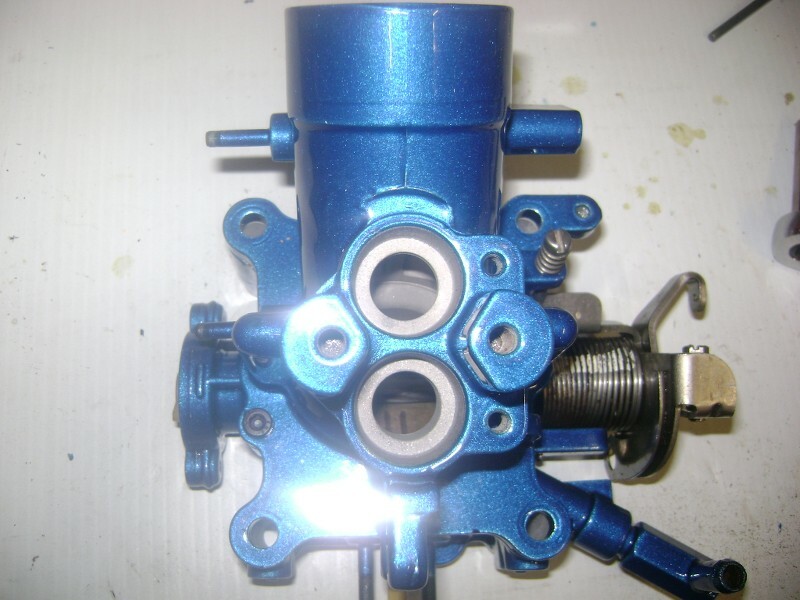 I decided to send mine out to Chad here on the board to have it machined out for domestic injectors. Whether you do this or not, the process of rebuild is pretty much the same. 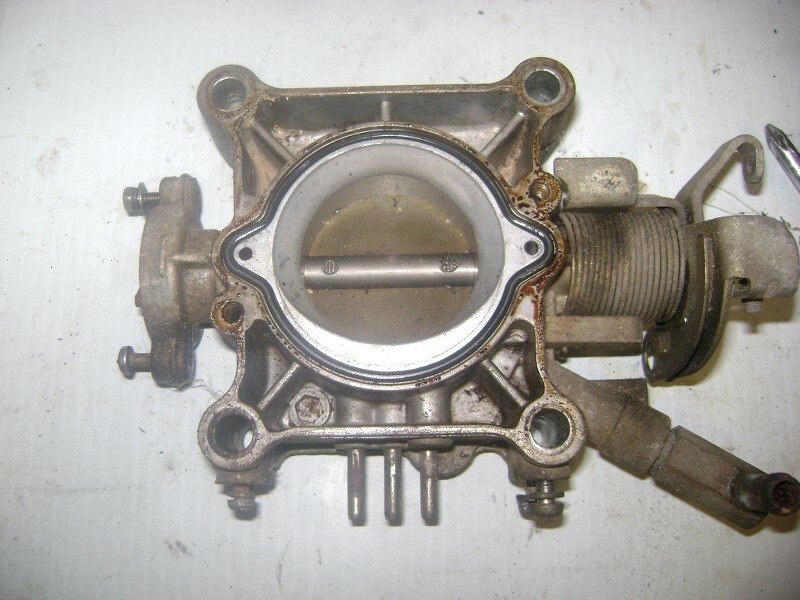 In OEM form the top injector housing is a bit narrower and has screens down inside. Be careful not to damage the screens. Chad's modification machines this area out slightly and eliminates the screens. This is mine after having it powdercoated to match the rest of the TB assembly. 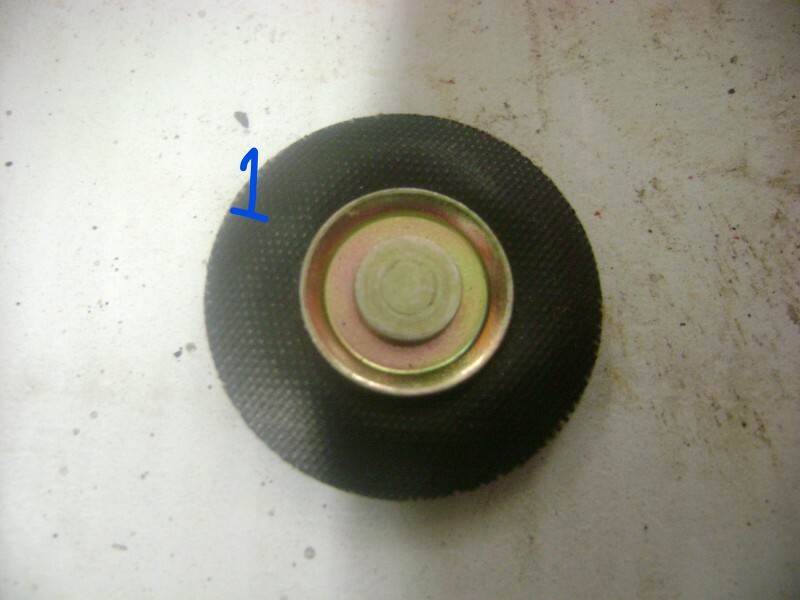 First, we're going to start by installing the dampener diaphragm. You want to make sure you install this thing the right direction. There are 2 DIFFERENT sides to it. 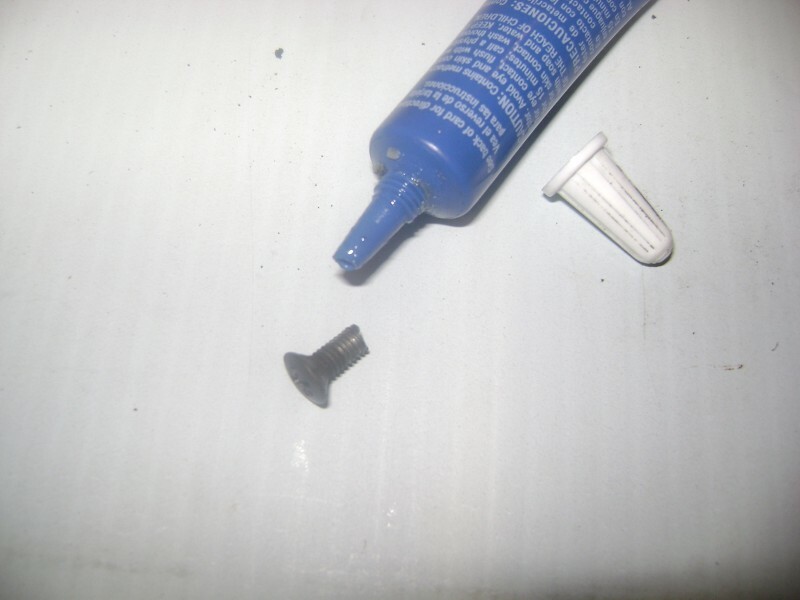 Next, there's an o-ring from your GP kit that goes on the cap. Find that and carefully slip it over. 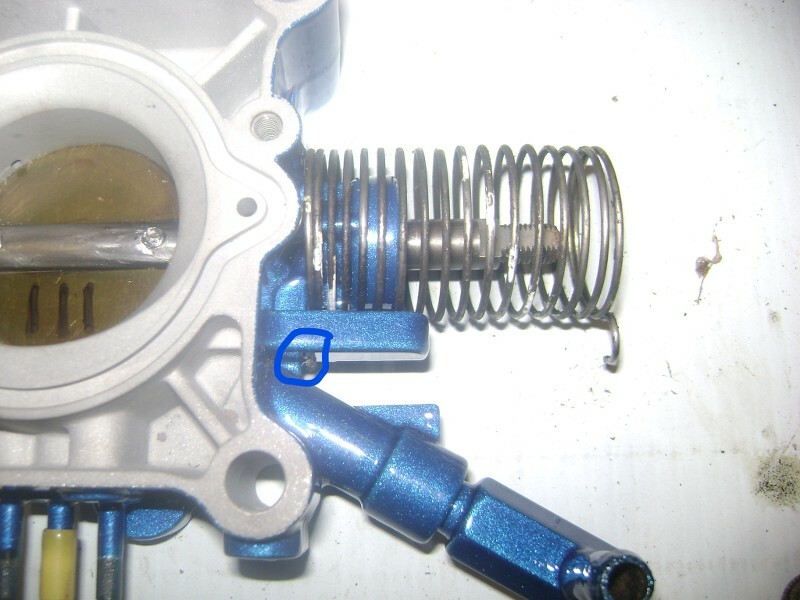 Hopefully you didn't misplace your spring, b/c we're going to drop that in next. 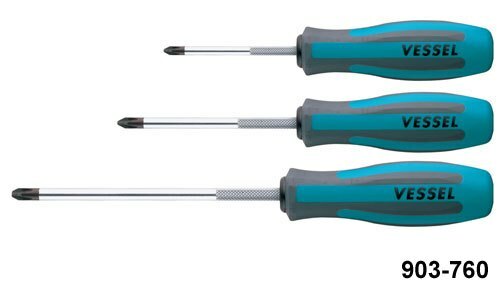 Tighten everything down with an 8mm nutdriver. 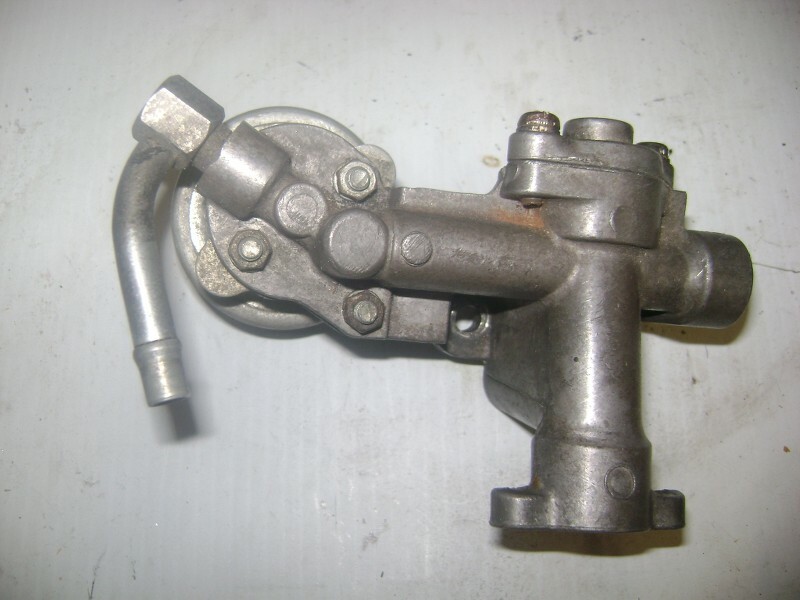 Now we're going to remount that Fuel Pressure Regulator (FPR). Here again I'm going to deviate from stock and install a Trilogy adjustable FPR. 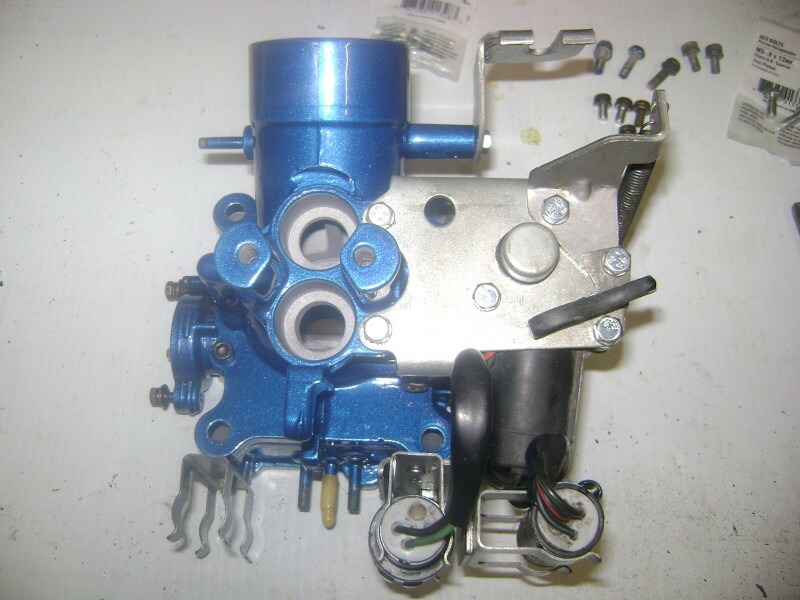 This particular unit mounts in the stock location though, so the process is the same. The 3rd option is you can pick up an adjustable FPR from FuelLab or Aeromotive or some other company like that and do a custom setup. 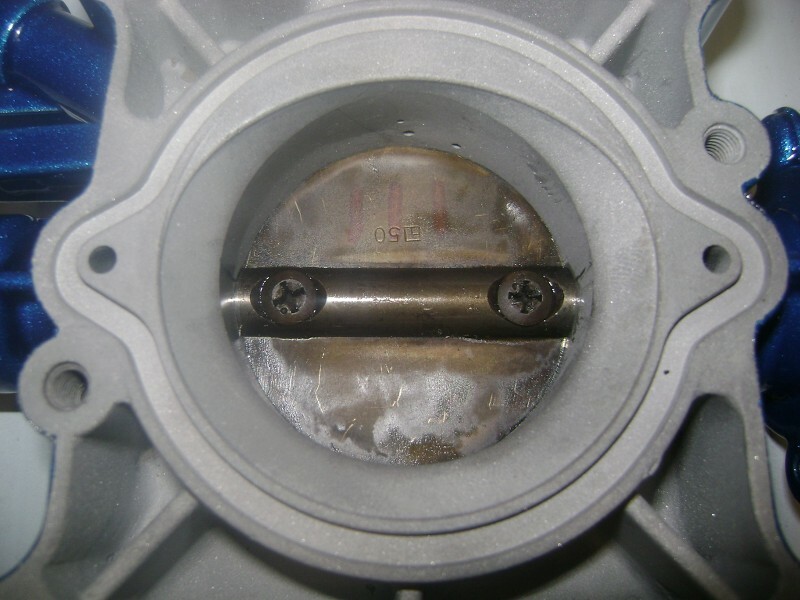 There are two small gaskets in your kit that go on the FPR. 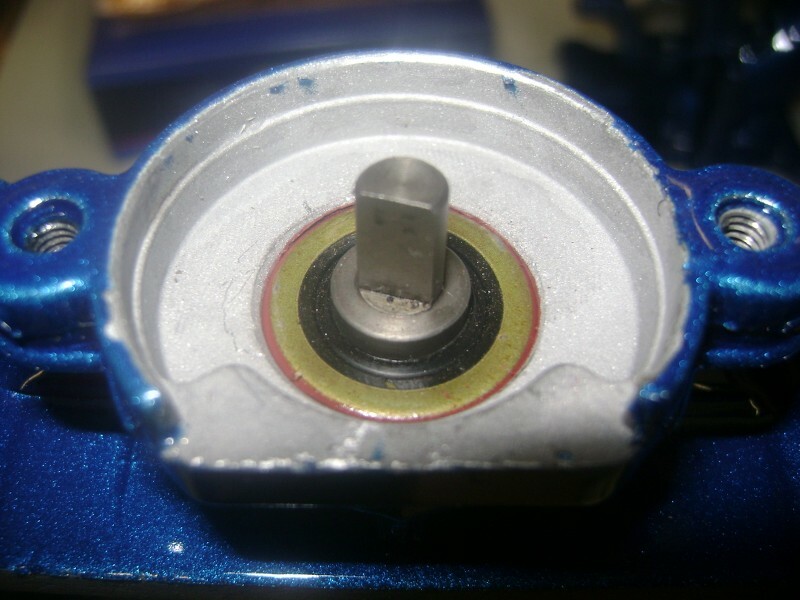 Reinstall in on the housing with the 3 8mm nuts and tighten everything down with your nut driver again. 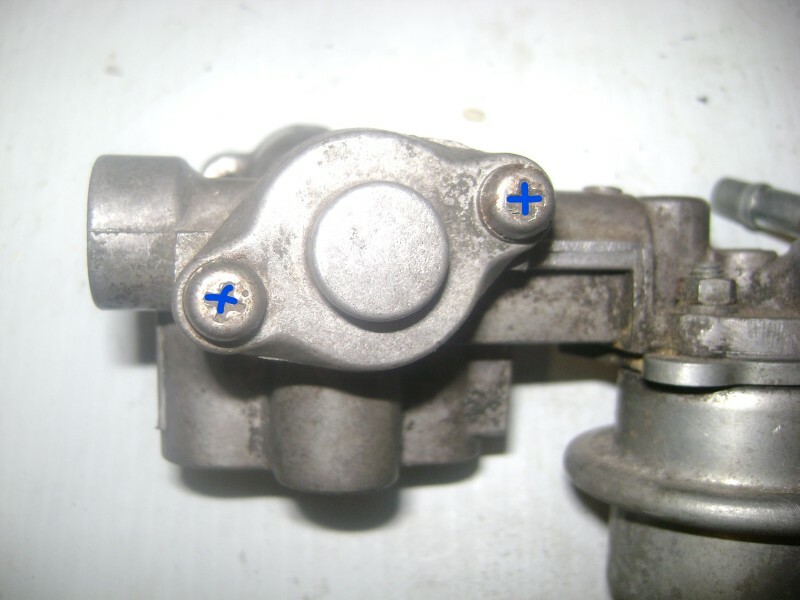 Now's its time to look at the injectors. 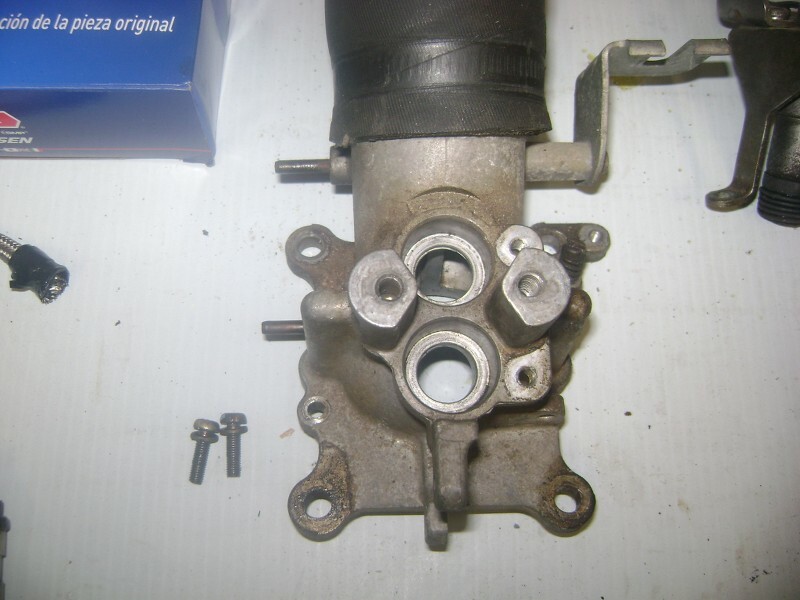 Good stock injectors are getting harder and harder to find. Most of them have failed over the last 30 years, and many many many of them leak. If you want to chance it, you can send them out to be tested, but it cost money of course and there's no guarantee yours are good. Sometimes you can get lucky and find them F/S on the board here. Other options do exist. 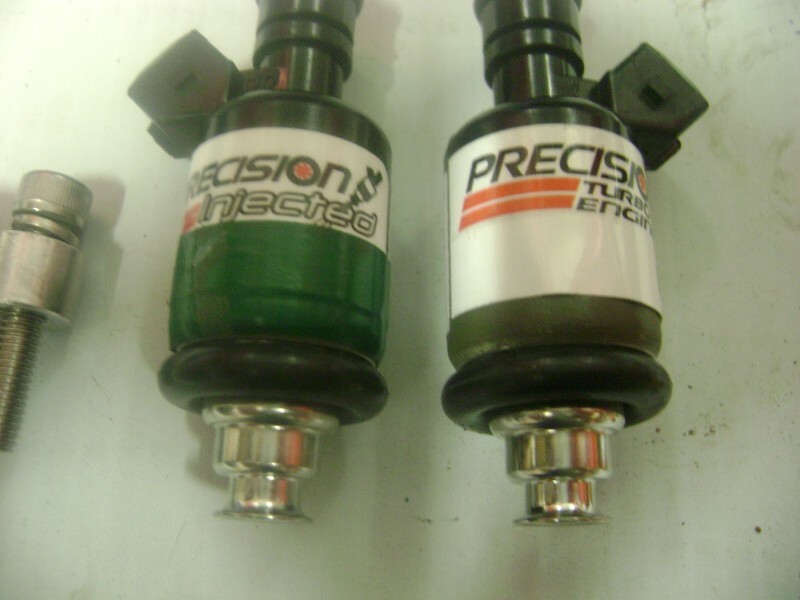 Trilogy and FIC make replacement Mitsu style injectors for these cars. They are often listed on eBay and can found on here as well. 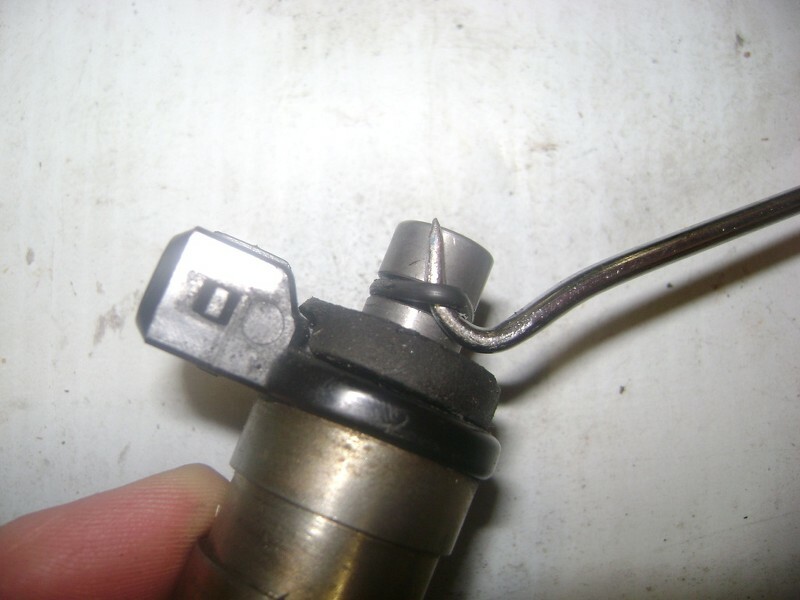 I believe I was told once the Trilogy injectors are just re-badged FIC's. 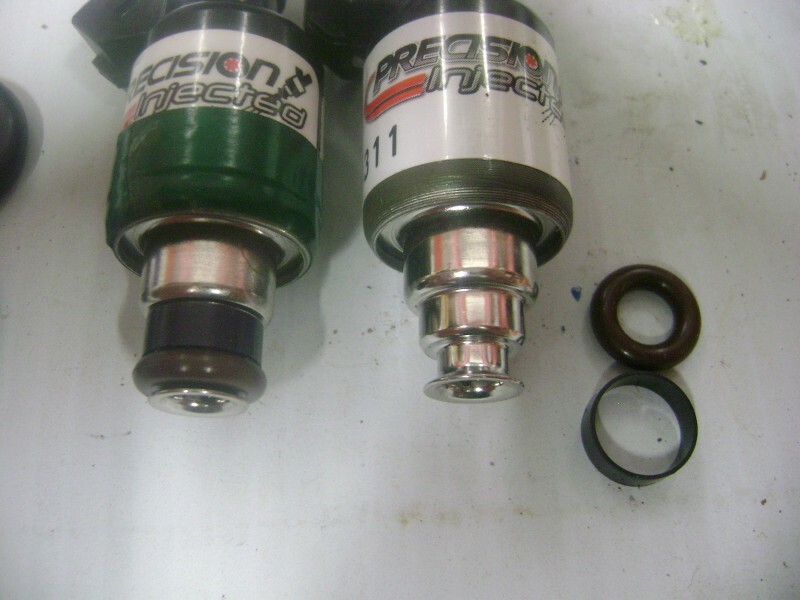 You can even buy the injectors and FPR from Trilogy as a package deal. 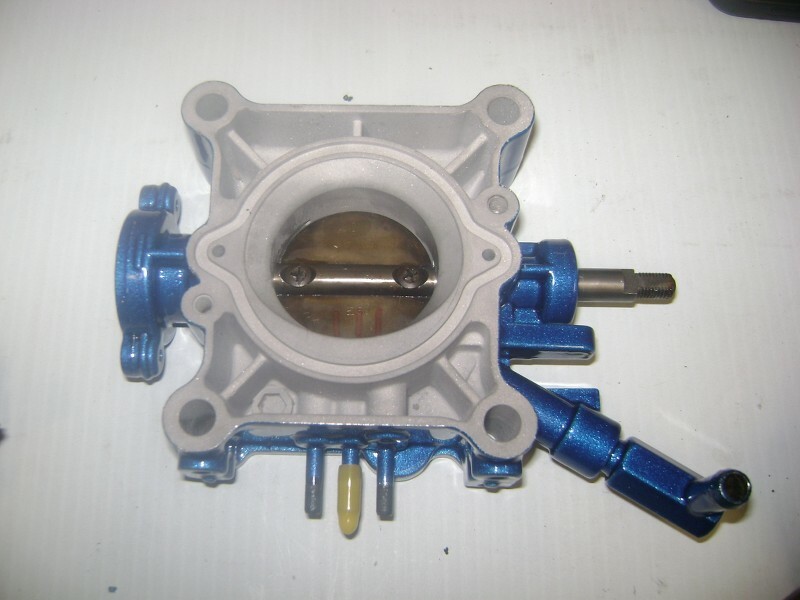 If you have your injector housing machined out, then you can run domestic injectors and have many more replacement options. I went with the latter of course b/c I had my housing modified to fit domestics. 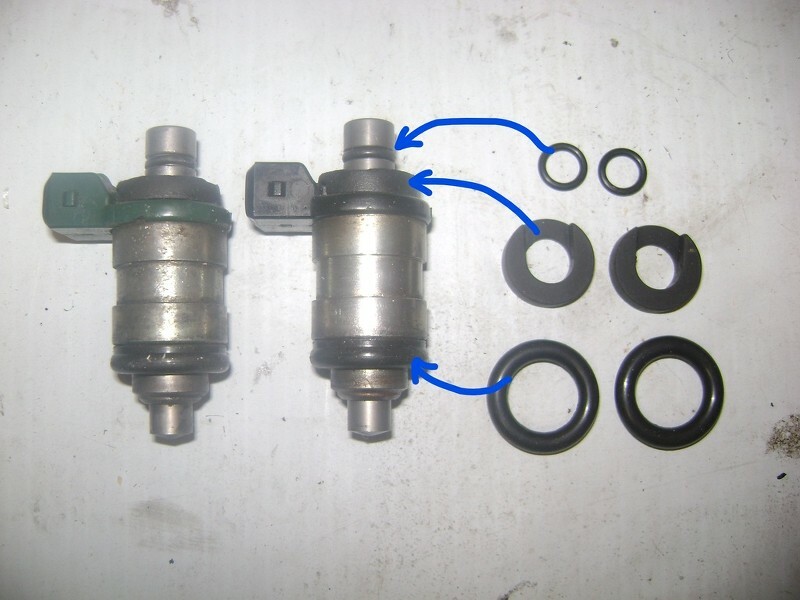 I will cover both OEM and Domestic injector installation next. I'll start with my build first. 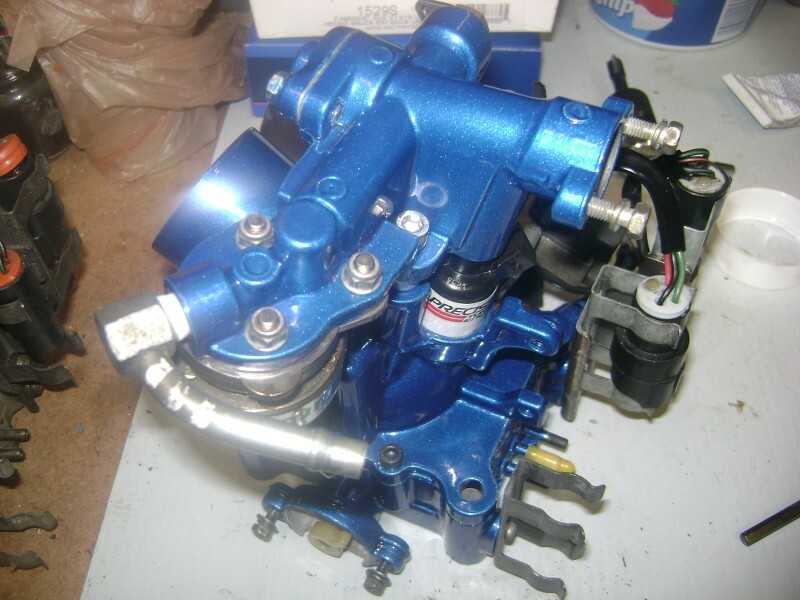 I picked up these injectors from Verocious Motorsports. 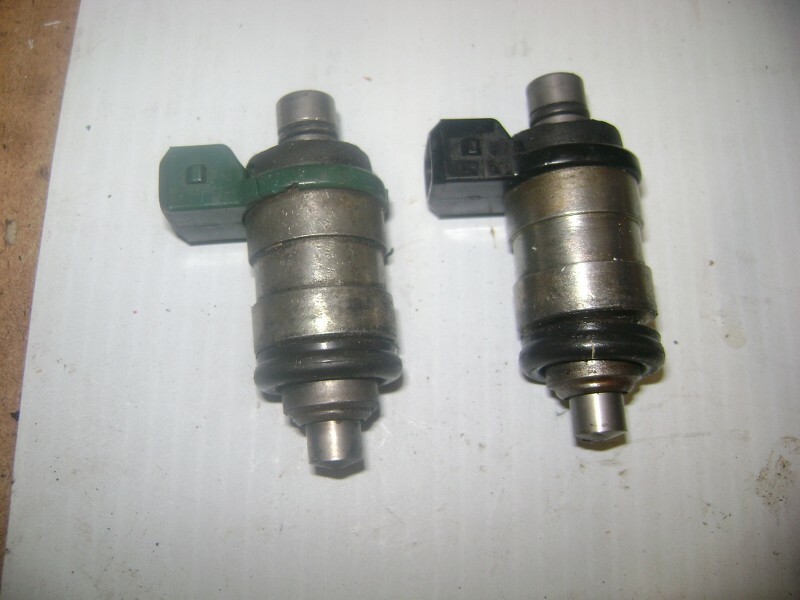 They are 95lb and 55lb injectors respectively. Chad provided the hardware and the two o-rings you see to the right in addition to the machining he did. 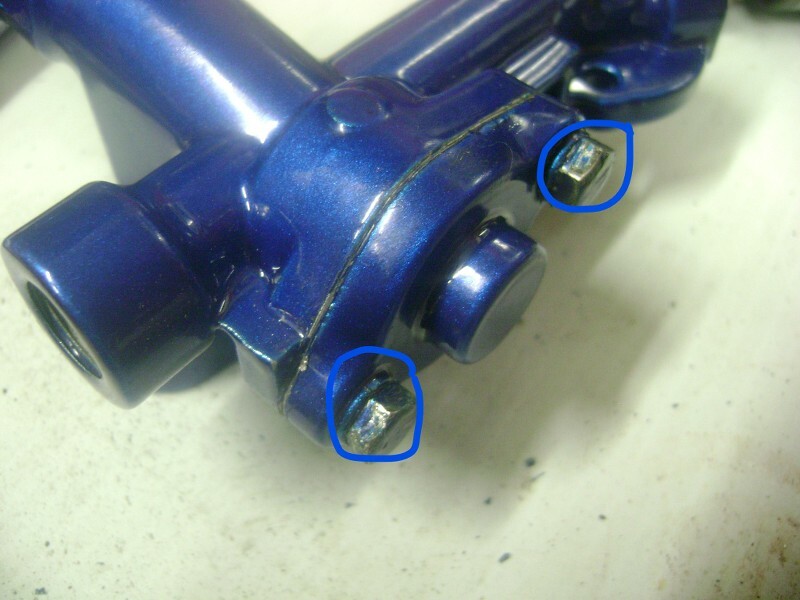 You might remember at the top of this topic the first thing we did was remove those awful screws Mitsu had in there from the factory. Do NOT re-install them. 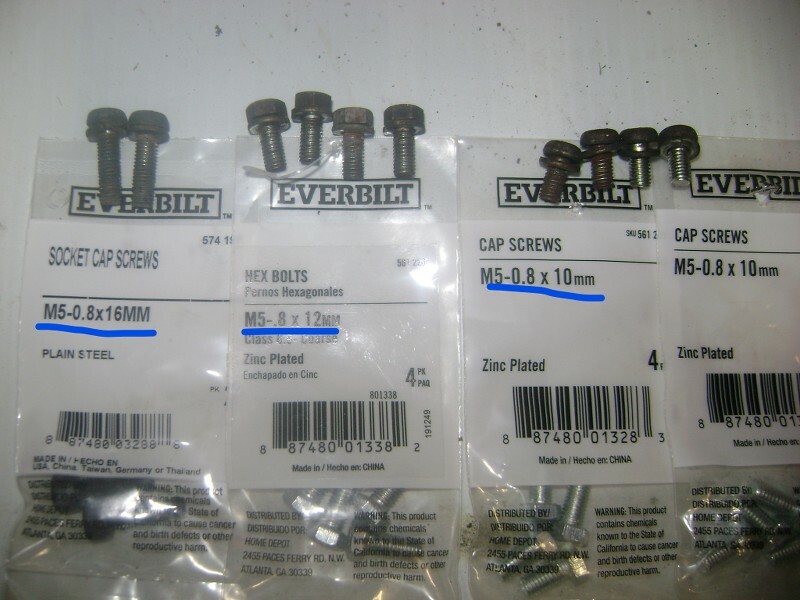 Get a nice set of allen key screws M6 - 1.0 x 20mm is the OEM size. 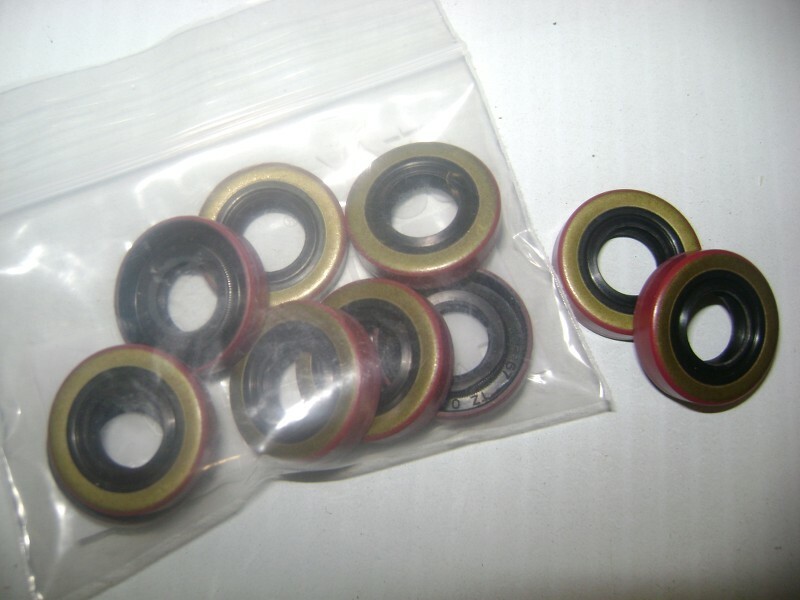 You'll need longer ones, maybe 25mm, with spacers if you go with the FIC's or Trilogy's. I believe Trilogy provides them if you buy from them. I also wrapped the corresponding "green" injector with green electrical tape just to make sure I installed it in the correct position. 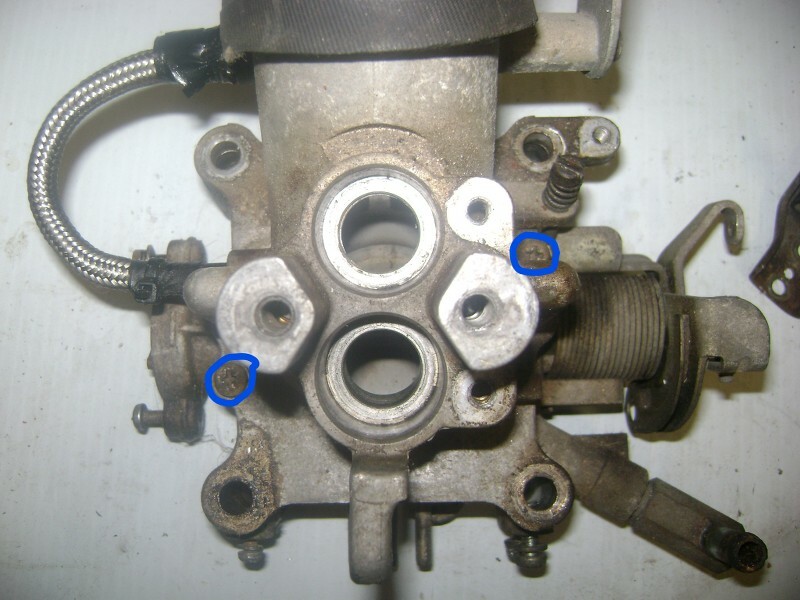 If you go with Domestic injectors, the lower two gaskets aren't necessary in this setup, so rather than risk them coming off on their own and ending up in the motor, remove them. 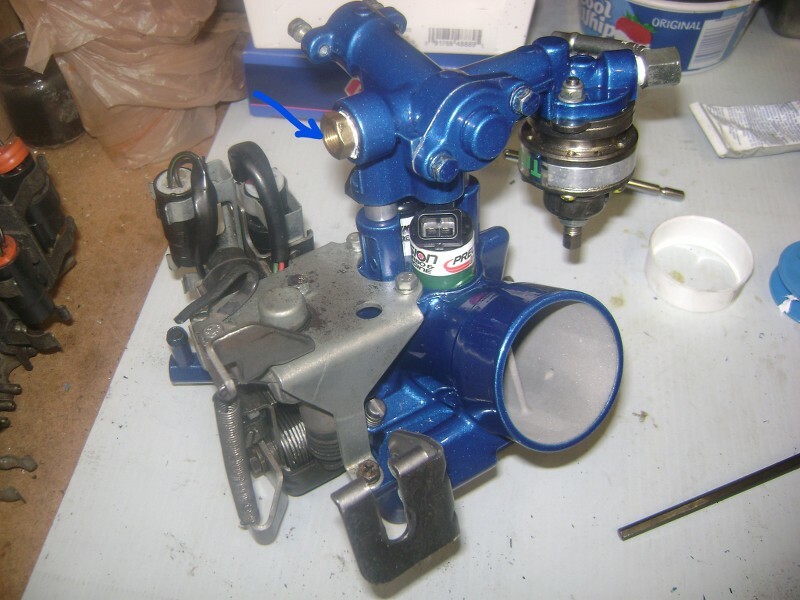 All you need is the provided o-ring on the top that came with your injectors, and the o-ring seats provided by Chad. 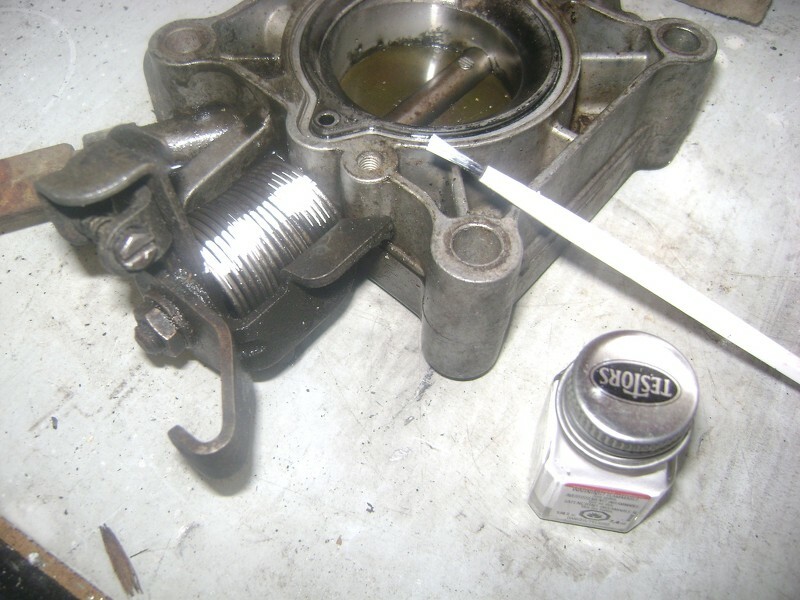 Gently push them down into the TB housing, and before you put the injector housing on, put some luby-lube on the o-rings. 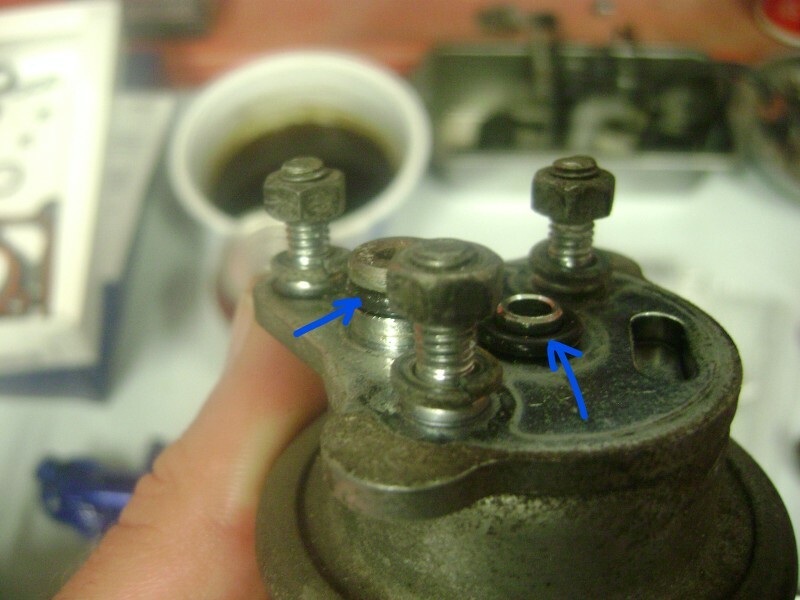 Now you can tighten down the injector housing with those new screws you got. 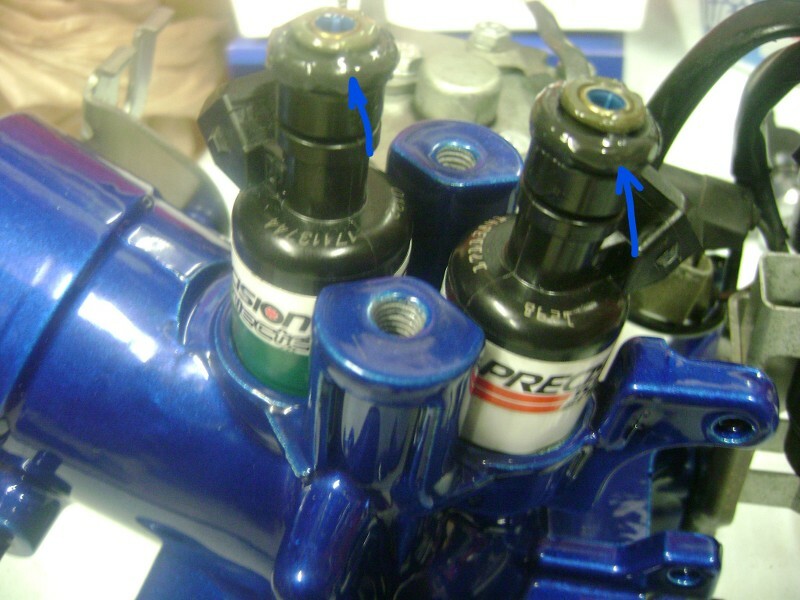 You can see how the spacer makes up for the extra height of the injectors in this picture. Edited by techboy, 21 September 2017 - 08:41 PM. 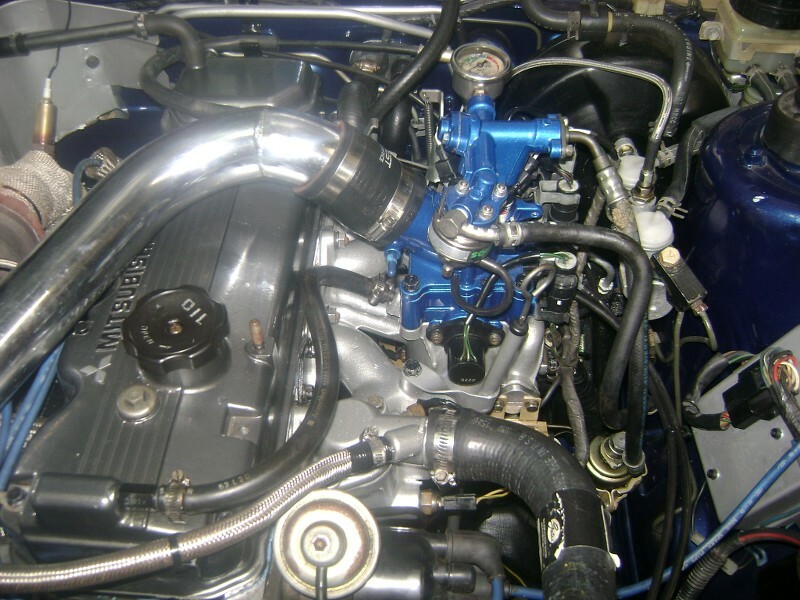 Let's wrap that all up now by talking about the OEM injectors. 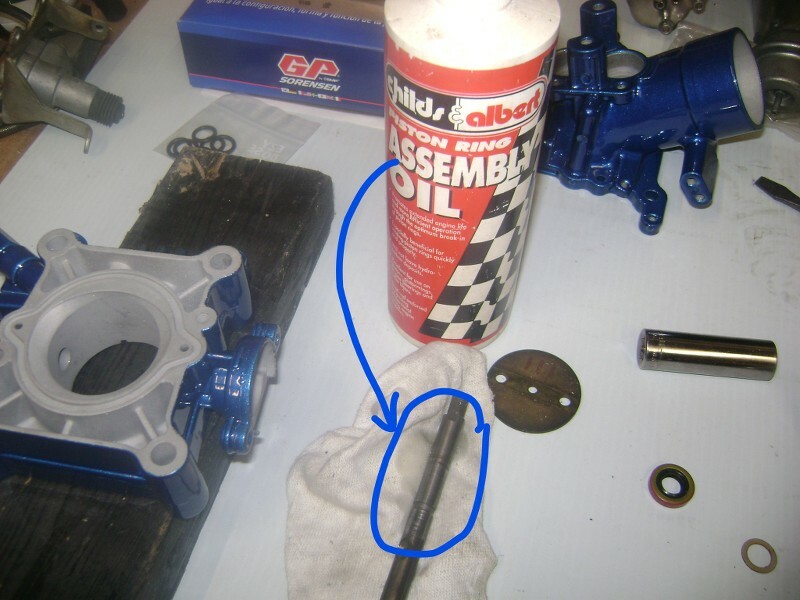 If you're reinstalling OEM injectors then you should still have a few gaskets left over in your GP kit. 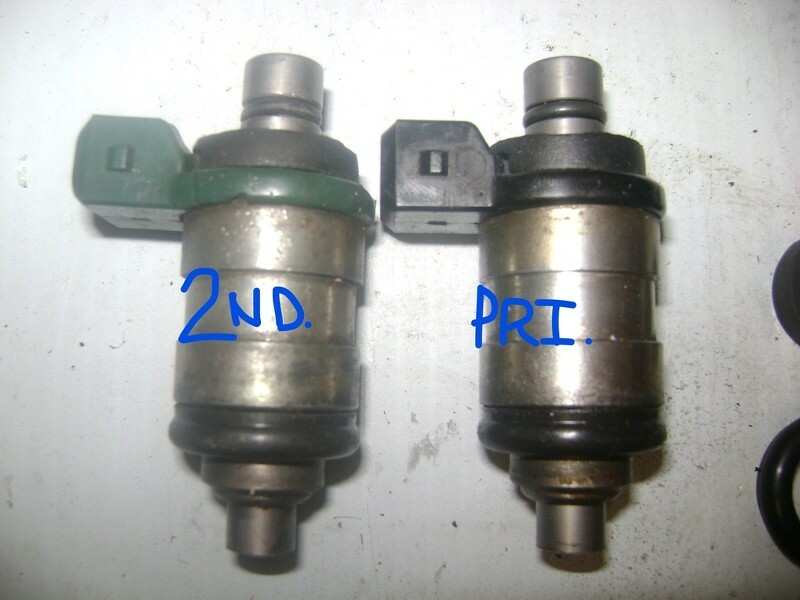 But first, let's look at the OEM injectors. You have a black-top one which is your primary and rated at 650cc and a green-top one which is rated at 950cc and is the secondary. 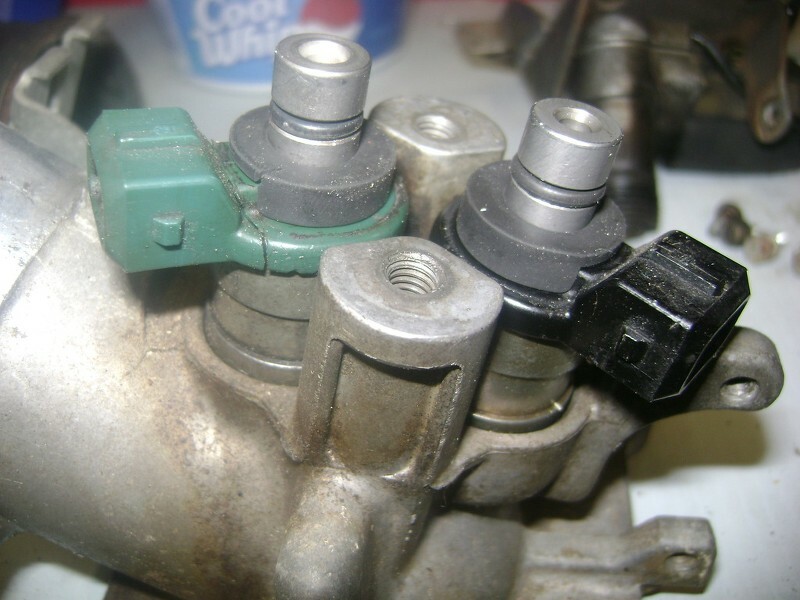 When reinstalling make sure you get them back in the right positions and you hook the proper injectors clip up to them in the car or it won't run right. 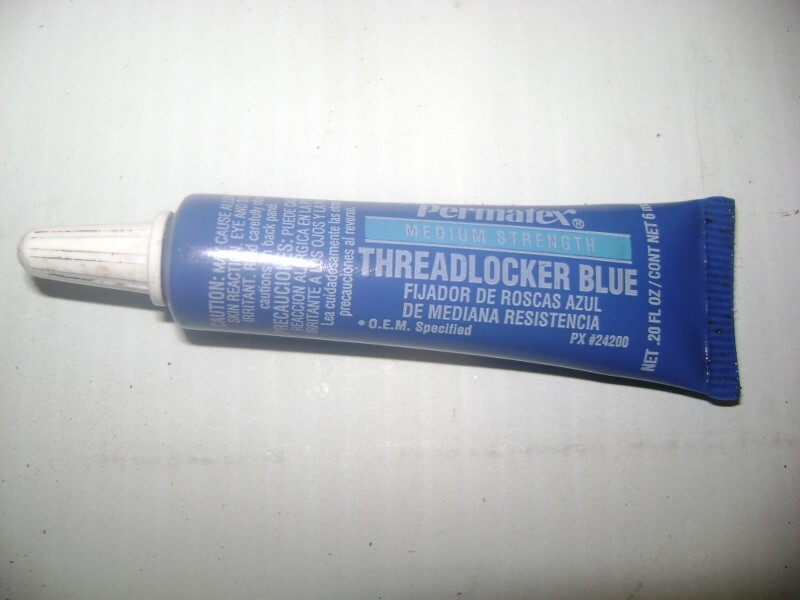 These things are notorious for cracking as the plastic becomes old and brittle. They are pretty much no good once that happens. This green one has a classic crack in it. 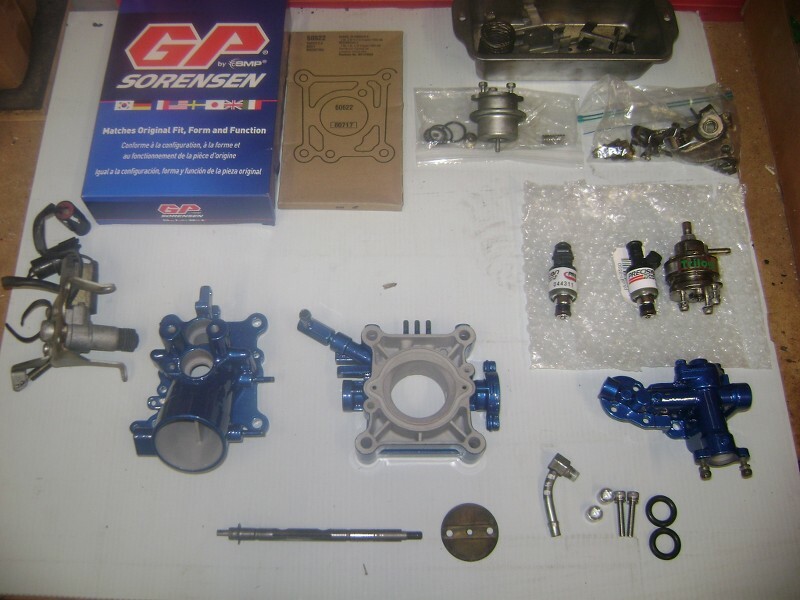 As far as putting the gaskets on these from you kit - it's pretty straight forward. 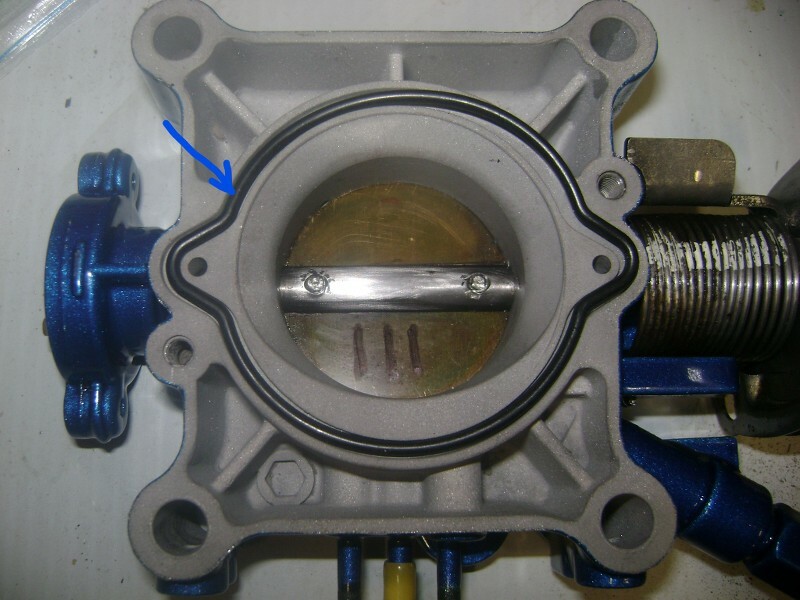 Just replace each gasket with the corresponding gasket as shown below. 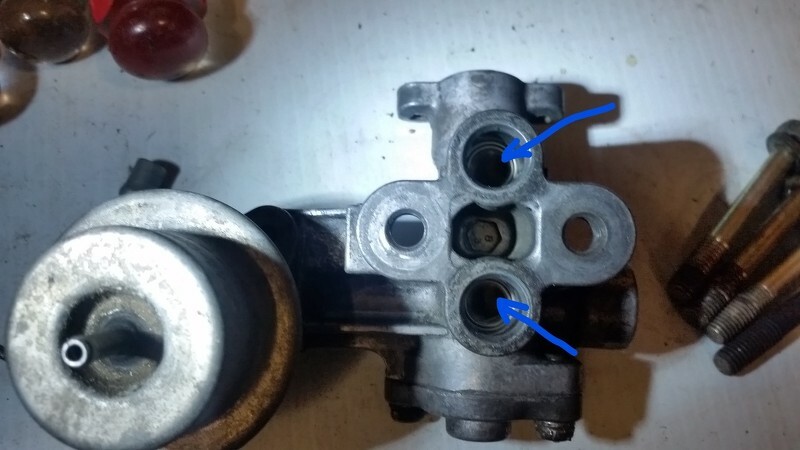 When you put the larger top gasket on, there's a notch in the gasket that fits over the injector clip. Make sure you orient it correctly. 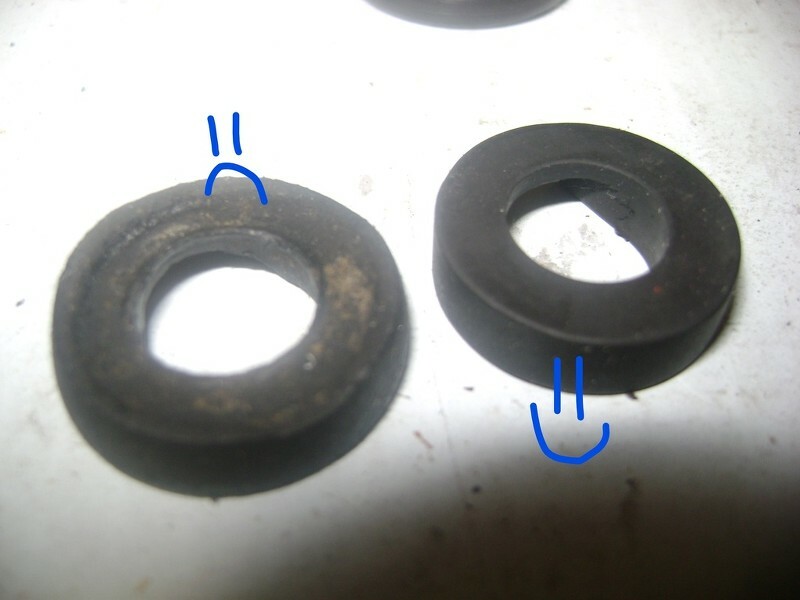 Here's a side by side of a new vs. old gasket. 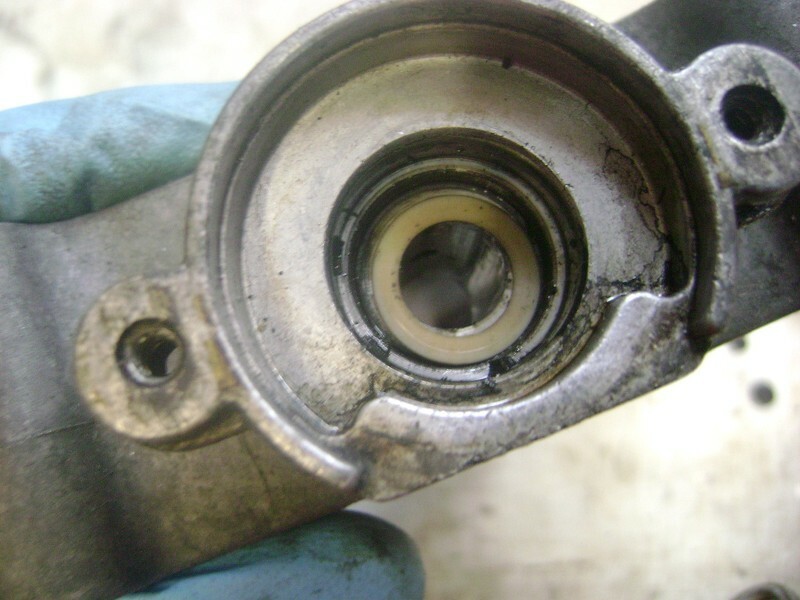 You can see how compressed the gasket became over time. 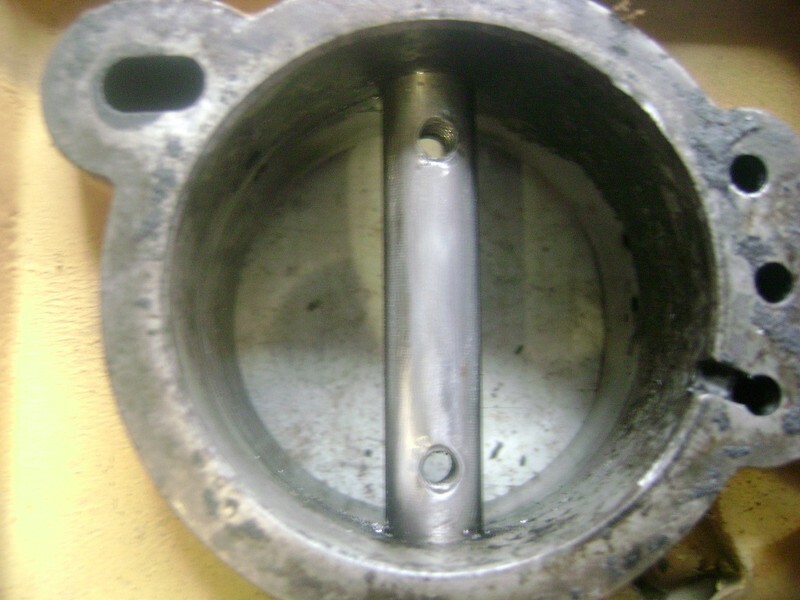 I forgot to take a pic of the bottom gaskets, but they just slip on and off. So, slide on your new ones and install them in the mixer housing gently and you are good to go. 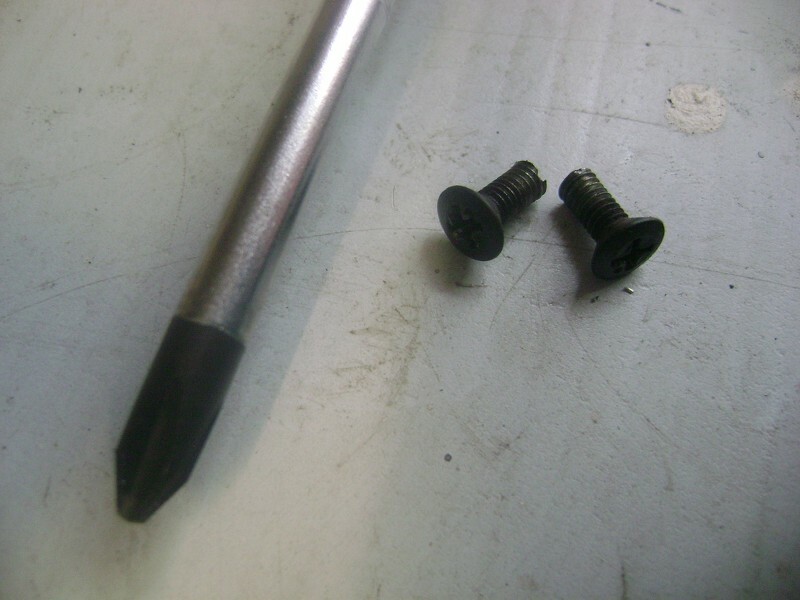 I said this above, but your OEM replacement screw for attaching the injector housing and mixer is a M6 - 1.0 x 20mm. Go invest in two new ones. Ta-Dah!! Once everything is all back together you should have something that looks like this. 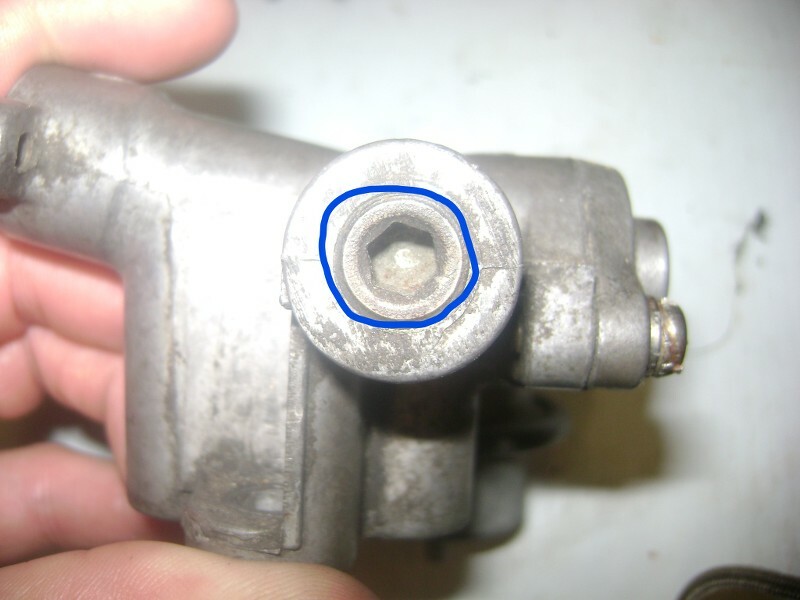 You'll notice where the blue arrow is on mine I removed the taper plug that's in there OEM and tapped it out to a standard 1/4" NPT. 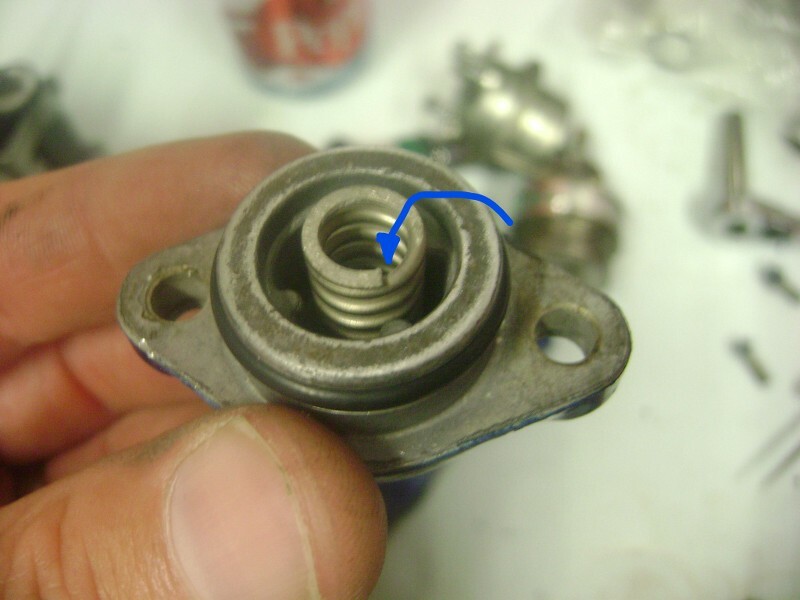 This allowed me to install a 1/4" to 1/8" inch NPT reducer which just about any fuel pressure gauge should thread into. 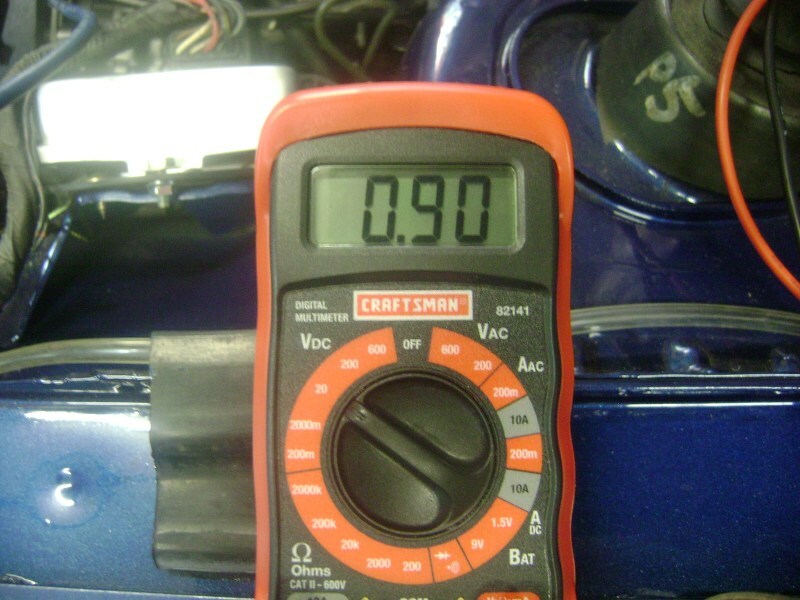 Even if you don't keep the gauge permanently this will make achieving a base idle fuel pressure much easier. Especially if you installed some sort of aftermarket FPR. And here it is installed back on the car. 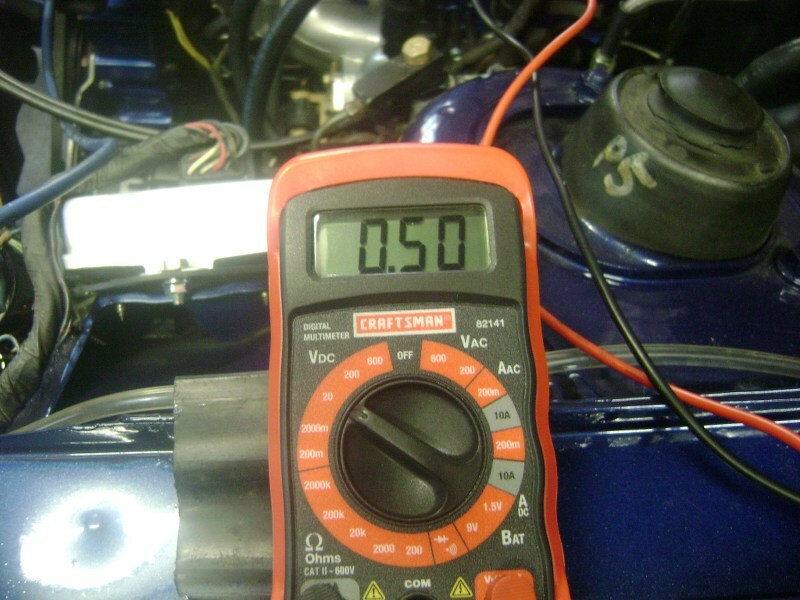 Because of all the changes I made I had to adjust the fuel pressure a few times to get the car to start and stay running. It kept wanting to stall out. As soon as you can get it running though, you want to walk through the TPS reset procedure. It just requires a little bit of time and a multimeter. The link can be found in the FAQ. Or, you can click on it here: http://www.starquest...showtopic=28069 There are 3 different write-ups in that link. I actually prefer the 1st one by Mike C. It's a bit wordy com[pared to the other 2, but I find it works consistently for me everytime. I won't go through the whole procedure b/c it's already been documented, but the 2 keys in my mind are getting the ISC to read .90 volts and the TPS to read .50. 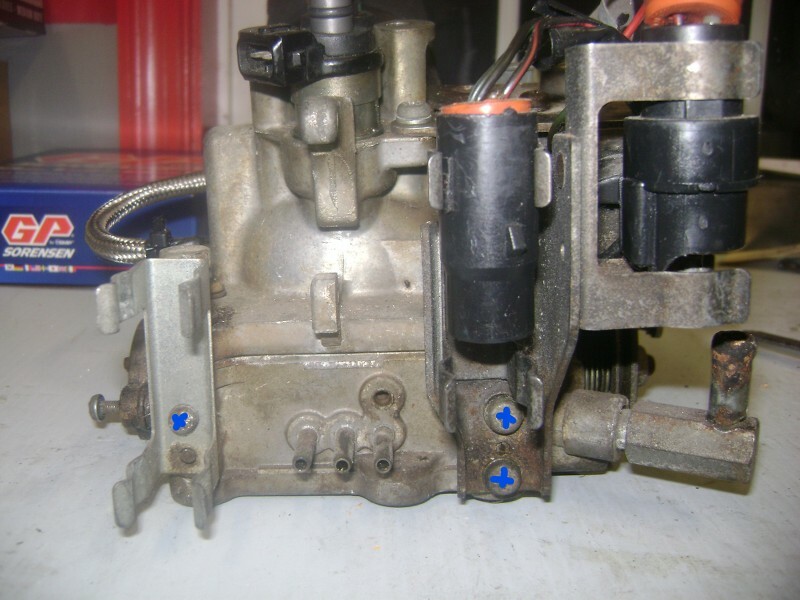 There's probably not an easier or more cost-effective rebuild you can do to get your car running better. So, if it's acting strange, get to it. Good luck with those rebuilds! I hope this is helpful for a few of you guys. I put way more time into this than I thought I would, but I think it's worth it. If you see any errors or something isn't right please PM me or a moderator so it gets corrected. The thread is hanging out here for now briefly, but it will be moved to the FAQ shortly.